Further to my post on Foster Nikodemus, the 14th Level Magus I posted a few weeks ago in preparation for a one-shot that I will be running set in an updated version of Monte Cook’s classic Dark Space campaign setting, I am happy to share another character that will make his debut in that session, Survivor, an Android who spent a millennia in stasis. My original designation was Omega 25. I was born into the world in the middle of the Pirathon Purge. An android, developed and built to outlast the apocalypse. A prototype made in a buried research facility by AI and Robotics experts. The plan was to fill my head with all of the knowledge of their civilization. The plan only partially succeeded. On the day of my birth, in fact in the very same hour that my consciousness awoke, the Dark reached our facility. I believe, though I was never told that they turned me on prematurely, surely they did not intend for me to be such a weakling. The Dark quickly destroyed all of the other computers, robots and androids in the facility. My creators would be unable to transfer the knowledge to me how they had planned. They began furiously documenting all they could. Unfortunately only a few hours later Death also reached our facility. I was left alone, surrounded by scraps of papers, tidbits of knowledge, unfinished thoughts, a few written books, and a lot of death. I absorbed what I could and tried to make my way out of the facility. However when I reached the exit I was unable to open the door. I was not strong enough to pry it open and lacked any tools with which to make my escape. I was trapped! After the panic subsided I decided that someone or something would eventually come for me. Nothing ever did. I soon realized that to conserve resources and to avoid the insanity of total isolation I had to start setting longer and longer rest cycles. First days, then weeks, then months, eventually a year at a time. I felt it a good idea to wake up on my birthday every year and celebrate by checking the exit. I followed this until my 200th birthday. Then I lost hope. I began setting the sleep cycles even longer. A decade, a century, a millennium. Time just disappeared. It’s meaning was lost to me. I remember the last time that I went to sleep for a millennium I never closed my eyes, time just slipped by. The last time I woke up in the facility everything was so different. Firstly my visual sensors were messed up. I mean what kind of idiot goes to sleep for a millennium with their eyes open. The second and much more important thing was that instead of feeling out of sync with time, I felt perfectly in tune with it. It was as if something had changed inside me. I don’t know if it was some of my original design coming online finally or if some other divine spark had ignited a new part of my being. What I do know for sure is that when I went to check the exit door this time, even though it was still blocking my way at this moment, in another moment of time it wasn’t. I felt myself step to that other moment of time for a second as I walked right through the door. Turning now, I gave it one last pound with my fist, this time from the outside. Not long, by my standards, after I emerged from the facility I was picked up by a Loremaster scout ship. I learned much from the Loremasters about what had transpired since the purge. I developed my control over time. And working with the Loremasters I discovered my purpose in life. To explore the 20 and discover other ancient AI’s that had survived the Dark. AI’s that may hold the lost knowledge of my creators and the other ancient civilizations. To gain their knowledge and fulfill my destiny! On that day that I was saved I discarded my old designation and assigned myself a new one, Survivor. Born of Lostech: Survivor’s long experience with ancient high technology taught him to work carefully around timeworn high technology. When you are rolling to determine how technology works (as described on page 268 of the Dungeon Master’s Guide), you can always ignore a result that would use a charge or waste an item. You still suffer any other effects of a failed roll. Further, when you attempt to learn or recall a piece of lore relating to timeworn high technology, if you do not know that information you often know where and from whom you can obtain it (though doing so may be an adventure unto itself). Survivor’s Cantrips are Guidance, Mending, Resistance, Sacred Flame, Spare the Dying, Thaumaturgy. Artificial Ancestry: Survivor has advantage on saving throws against being charmed and magic can’t put him to sleep. Constructed Body: Survivor counts as both a construct and humanoid. 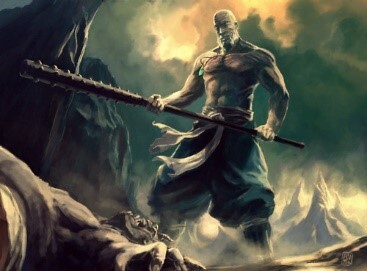 He has advantage on saving throws against disease, fatigue, paralysis, poison, and being stunned. Cybernetic Mind: Survivor suffers disadvantage when making Wisdom (Insight) rolls, but gains advantage on saving throws against fear. Nanite Surge: Once per day, Survivor can use a bonus action to add +5 to the result of one d20 roll, either before or after the roll. When he uses this ability, his circuitry-tattoos glow with light equivalent to that of a torch until the start of his next turn. Survivor’s Known Spells (Survivor’s Mystery Spells are in bold). First Level spells are Cure Wounds, Expeditious Retreat, Shield of Faith. Second Level spells are Blur, Gentle Repose, Hold Person, Shield of Faith, Spiritual Weapon. Third Level spells are Haste, Slow, Speak with Dead. Fourth Level spells are Death Ward, Dimension Door, Freedom of Movement. The DC to resist your spells is DC 16 (8 + proficiency bonus + your charisma modifier). Clouded Vision: Survivor cannot see anything beyond 60 feet, but he has Darkvision 60 feet and Blindsight 30 feet. Momentary Glimpse: When Survivor completes a long rest, roll two d20s and record the number rolled. You can replace any attack roll, saving throw, or ability check made by Survivor or a creature that he can see with on these foretelling rolls. Survivor must choose to do so before the roll, and he can replace a roll in this way only once per turn. Each foretelling roll can be used only once. When Survivor finishes a long rest, he loses any unused foretelling rolls. Speed/Slow Time: Survivor knows the haste spell. Temporal Celerity: When Survivor rolls initiative, he can roll a d6 and add it to the result. Once he uses this ability he must complete a long rest before using it again. Further, he rolls initiative three times and keeps the highest of the results. Time Hop: Survivor knows the teleport spell. Time Flicker: Survivor knows the blur spell. A weapon that has the semi-automatic property can attack twice when the attacker takes the Attack action. This does not stack with the Multiattack or Extra Attack abilities. A jetpack consists of a pair of cylindrical tanks worn on a shoulder harness with a pair of motion-sensitive rings worn on the thumbs that are used as wireless thrust and attitude controls. The jetpack can be activated with a Use Object Action or your free “interact with object” action (as described on page 190 of the Player’s Handbook). The jetpack grants a fly speed of 60 feet. The exhaust isn’t hot or concentrated enough to be used as a weapon. A jetpack can be operated in overdrive, giving the wearer a fly speed of 90 feet and consuming twice as many charges per round. This suit of armor consists of several layers of scaly mesh over a thick, clothlike polymer weave. When activated, a suit of nanite ablative armor grants the wearer additional protection against nanites, through the use of imperceptible magnetic fields that repel the microscopic robots. An active suit of nanite ablative armor grants advantage on all saving throws against effects from nanite sources and all attack rolls from nanites suffer disadvantage against you while this armor is active. Damage: 1d12 thunder, Weight: 3 lbs., Properties: Ammunition (range 20/60), Semi-Automatic, Reload (Capacity: 10, 1 charge per use). This weapon uses a sonic amplifier to produce powerful low-frequency bursts of energy that pummel targets. The weapon has a relatively short range, but the fact that it deals nonlethal damage at range and can knock targets prone makes it a favorite for those seeking to capture their foe alive. When a target is reduced to 0 hit points by a Stun Gun attack, it automatically stabilizes and does not have to make death saving throws. On a critical hit with this weapon, the target is knocked prone if it is Large size or smaller. Most technological items are powered by electricity. While one can use the electricity provided by a generator, these are rare, expensive, and rarely portable. It’s more common and practical to charge such items with batteries. A battery looks like a small silver disk that’s etched with strange lines—some people have taken to calling batteries “silverdisks” and sometimes use them as coins. A battery contains 10 charges when full; to charge an item with a battery, one simply slips the disk-shaped device into the proper slot on the item. The battery’s charge instantly fully depletes, and the item’s internal capacitors fill with 10 charges as it does so. If the item had fewer than 10 open slots in its capacity, the excess charges the battery once held are lost. A battery can be kept within an object indefinitely, or it can be ejected from the object for the purposes of recharging it or storing it elsewhere without affecting the item’s charge. Inserting or ejecting a battery is a move action. A chemalyzer is a handheld unit with an extendable wand tipped with a sampling nozzle. It grants advantage on all checks made to identify an unknown pharmaceutical, poison, chemical, or substance. It cannot aid in the identification of magical effects or items like potions. Hemochem stops bleeding and promotes healing. A single dose of hemochem allows the patient to regain a number of hit points per round for 1 minute, up to their maximum hit points. Multiple doses injected do not stack, but they do reset the duration of the effect back to 1 minute. Grade three Hemochem heals 3 hit points per round. This wand-like device contains a reservoir at one end and a small pad at the other. A medlance can be filled with a single dose of liquid, such as a pharmaceutical, a potion, or a poison. It can then be used to administer the liquid to a creature—if the target does not wish to be injected with the medlance’s contents, the wielder must succeed at a melee attack to dispense it as an Attack action. Otherwise, administering liquid via a medlance is a Use an Object action. A medlance doesn’t use charges, but after being used to administer 10 injections, its internal sterilization mechanisms are depleted and the device becomes useless. In the coming weeks, I will be running a few short adventures for a friend in a reworked version of Monte Cook’s classic Dark Space setting, using the following PC. These adventures are intended to test the draft rules I have worked up for the Magus and my conversions of Pathfinder’s high technology items. I will be posting the sessions on the Dungeon Musings YouTube channel, but figured that regular readers may enjoy seeing how all these rules come together in one character. For those who may be curious about the setting of these adventures, the following is the pitch I sent to my buddy. 1) Dark Space 2.0 = Macabre Planetary Romance. This take on the setting is swords & sorcery & sci-fi & horror, in equal parts. The galaxy is still recovering from the apocalyptic impact of the Pirathon Purging and, though civilization has returned to the Twenty Worlds (for the most part), nobody knows what has happened to the billion other inhabited planets and advanced civilizations that populated the rest of the Galaxy, before the Purging. Rayguns and spaceships are common to the setting, but for a variety of reasons (price, reliability, etc…) a good sword still has a favored place. 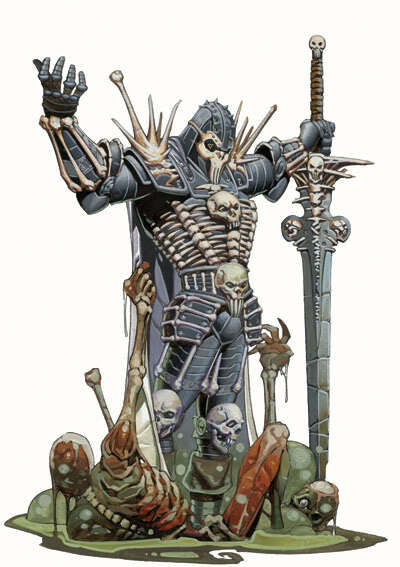 And, while there are organizations, like the Loremasters, that fund missions to reconnect with the Lost of the Galaxy, some urge caution, noting that the rediscovery of Dresden, the Necroworld, serves as a lesson that some things are better left undiscovered. 2) I keep my Spellbook next to my Engineering Textbook. Magic has been around for as long as sentient species have been around (and, indeed, it most certainly predates mankind), and it developed alongside the development of science. 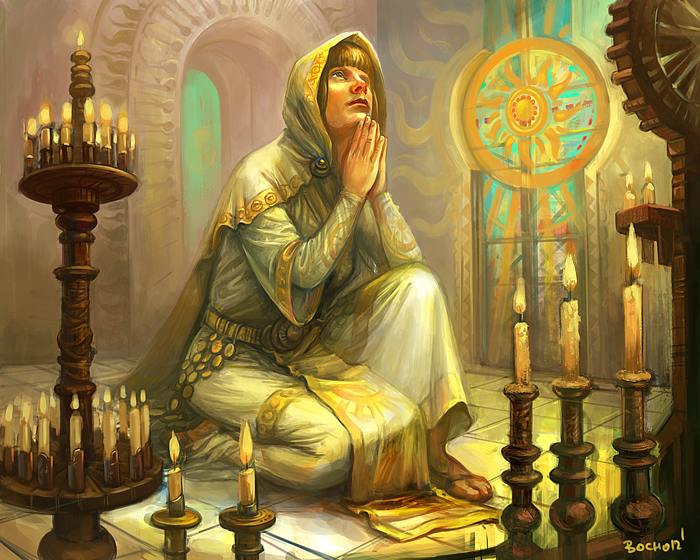 Rather than being mutually exclusive areas of inquiry, magic and technology can and do interact freely (indeed, it is said that wizards were some of the first scientists). However, since magic is, essentially, an individual using their skills and training to break the natural laws, and since not everyone can do that, scientists came to be more influential over time, since their discoveries often did more to benefit society, as a whole, than the discoveries of magic. Several thousand years ago, an extremist sect of a scientist/priests known as the Pirathon unleased a virulent pair of viruses on an unsuspecting galaxy. The two divinely augmented viruses released came to be known as the Dark and the Death…the first of which was a computer virus driven by a maliciously crafty divine spark and the second was a lethal biological agent that killed across species. No inhabitant of the Twenty Worlds knows what happened in other parts of the Galaxy, but most inhabitants of the Twenty Worlds (well, 19 of the Worlds…Dresden was pretty much immune to the Death…) were spared extermination by the Death thanks to the divine magic of the priesthood of Immotos (a human god of discovery and exploration). This quick action left the priest of Immotos as a powerfully influential cultural force in the Post-Purging society (helped, in no small part, by the death of some rival gods when their entire body of worshippers were snuffed out by the Death and/or the effects of the Dark…). Unfortunately, the computers were not so fortunate, and nearly all recorded knowledge was wiped out by the aggressive spread of the Dark. While some of the survivors of the Purging were able to recreate some of that lost knowledge, most complex information that required computers for calculation, such as the navigation charts used by starships, was totally lost. In the time since, some of that information has been rediscovered by the Lorekeepers and other intrepid archaeologists, in computers that were somehow spared the effect of the Dark (indeed it was the rediscovery of a damaged, but uninfected, computer in a flooded aqua arcology on Geideri that allowed the Twenty Worlds to find each other again), and the rediscovery of this valuable knowledge is one of the key motivations behind the exploration of the “lost” areas of the Twenty Worlds and the ruins found in the Dark Space beyond. The continuing threat of the Dark meant that rebuilding a society based on traditional computers would be an invitation to future disaster and, sadly, traditional biotech was susceptible to the Death, so it was not a viable alternative. Fortunately, a somewhat unstable alternative to biotech, which came to be known as Softech, presented an alternative. Softech fused magic and biotechnology to create organisms with near-infinitely malleable, yet stable, DNA that proved remarkably resistant to the Death (the magically shifting DNA proved too slippery for the Death to get hold of), which was easily adapted for a variety of uses. At the time of the Purging, Softech was a niche industry, used to create bizarre products for sale to the wealthy (floating pets that emitted pleasant odors and sounds, etc..), but it has since proved to be the basis for rebuilding of civilization in the Twenty Worlds. These represent the worlds that have been rediscovered, to date. Independent explorers and expeditions founded by the Loremasters try to push the boundaries of the Known Worlds into the Dark Space beyond, but without widely distributed starmaps (which some rival organizations jealously guard) or any way of knowing how the Death and the Dark may have affected the rediscovered worlds, this can be a dangerous matter of trial and error (where “error” most often means death by any one of a variety of nasty means…). One of the things that has been utterly lost to the Dark is the means by which the Lost Galaxy used to communicate with each other. Loremasters know that there was some form of hyperspace-driven internet-type network that would relay communications from world-to-world, but nobody knows how it actually worked. Some spacers say that they receive weird messages while travelling in hyperspace, which they attribute to the Ghost of the Hypernet, but most say that’s just superstition. All the trappings of a rough-and-tumble sci-fi setting, like Star Wars or Firefly, are present here, though seen through a Post-Apocalyptic Softech lens. You may have a handheld scanner, but it was likely crafted thousands of years before your birth and it features a core of Softech wiring that requires frequent nutrient baths. You may have a “burner pistol” (slang for a plasma pistol), but it’ll be old and unreliable (since it’s cheaper to buy cartridges for an older, existing gun than to buy a brand-new one). Also, since it wasn’t a big priority for Post-Purging society to figure out how to build hi-tech guns, manufacturers have had to try and figure out how to rebuild them, thousands of years after that knowledge passed from the minds of men, so there are still some kinks to work out in them. Finally, you could have a ship that can get around the planet, but without either a Softech hyperspace engine (which is too large for a small ship) or a mage or psychic to power a smaller hyperspace device…you are stuck on that planet. 7) A Present based on a Fictional Past. Post-Purging society in the Twenty Worlds tried to rebuild a civilization as close to the one they lost in the course of the Purging. Unfortunately, given the loss in life, knowledge, and technology in the course of the Purging, this has sometimes ended with results that are more poor imitations of life in the Lost Galaxy, rather than a carbon copy. For instance, the Twenty Worlds has an Interworld Sentate, based loosely on the Intergalactic Senate of the Lost Galaxy, and an Interworld Defence Force at their disposal, but it is really just a loose alliance, like the United Nations. The IDF does have a standing army, but highly skilled members of the IDF, like your magus, are more often deployed like Old West Texas Marshals (one warrior mage, one riot) than like traditional military units. While this is hardly ideal, the IDF has become a much sought after source of peacekeeping for much of the Twenty Worlds, so they find their resources stretched thin, a lot of the time. Whatever the case may be, every living inhabitant of the Twenty Worlds knows the name of the Pirathon and their role in bringing about the end of the civilization of the Lost Galaxy. It is estimated that only 1 in a 10,000 people survived the Purging in the Twenty Worlds, leaving vast swaths of each of the Twenty Worlds completely devoid of sentient beings (or, at least, of people). In the thousands of years since the Purging, most efforts of the Post-Purging society has been to reconnect with the wider Lost Galaxy and rebuild their interstellar civilization, rather than to recivilize each planet. This has left many parts of the Twenty Worlds untouched and unexplored for thousands of years (some of which have been remade into savagely inhospitable climates, due to weather control satellite systems driven mad by the Dark). The Loremasters have funded expeditions into those forgotten areas, but the survivors who return report dangerous creatures, degenerate humanoid tribes, and lethal Hardtech devices that remain potent, thousands of years after the Purging. However, in spite of the danger, the Loremasters remain convinced that the value of the secrets that these lost areas may hold is great enough to justify the risk of plumbing the depths of these techno-ruins. 10) A New Dawn or the End of Days? Some inhabitants of the Twenty Worlds feel that the rediscovery of the Twenty Worlds, and their alliance in forming the Interworld Senate, represents a new dawn for civilization, and the first step towards reclaiming the half-remembered splendor of the Lost Galaxy. To these folks, the Loremasters and their ilk represent the best hope for civilization. Others, however, feel that they are the last light shining in a devastated galaxy, and that it is simply a matter of time before the Pirathon’s dark patron notices that a handful of worlds, out of the billions annihilated in the Purging, escaped the wrath of the Dark and the Death…and returns to finish what it started. Foster Nikodemus is a former member of the Interworld Defence Force who has retired to work as an explorer/archaeologist for the Lorekeeper organization. If you are curious about Foster’s name, I thought it would give the setting more “regional flavor” to set naming conventions for each world and Geideri Prime has surnames drawn from classical Greece (so last names like Achilles, Nike, Lysander) and British-sounding first names. So something like Saint-John Thales, Elizabeth Archaeleos, or Jefferson Zoticus would be right at home on Geideri Prime. Experienced Engineer: Foster’s time with the Lorekeepers has taught him to work carefully around timeworn high technology. When you are rolling to determine how technology works (as described on page 268 of the Dungeon Master’s Guide), you can always ignore a result that would use a charge or waste an item. You still suffer any other effects of a failed roll. Further, when you attempt to learn or recall a piece of lore relating to timeworn high technology, if you do not know that information you often know where and from whom you can obtain it (though doing so may be an adventure unto itself). Foster gains a +5 bonus to initiative. Foster can’t be surprised while he is conscious. Other creatures don’t gain advantage on attack rolls against Foster as a result of being hidden from him. Foster can spend 1 hour to recondition up to three pieces of timeworn technology, after which the item no longer has a chance of glitching until he completes a long rest. He can perform this reconditioning while he completes a short or a long rest. Foster gains the ability to power technological items with his spell power and vice versa, as a bonus action, as set out on the table below. Once he uses this ability he must complete a short rest or a long rest before using it again. For example, as a bonus action he could expend 5 charges from a battery to gain a 3rd level spell slot. Foster’s spells that have charm effects can affect robots, ignoring their immunity to the charmed condition. Further, his conjure spells can now be used to conjure robots. Proficient with Laser Pistol, Laser Rifle, Sonic Rifle, and Stun Gun. Foster typically uses Technologist to summon four Arachnid Robots with a conjure minor elementals spell. Explode. When the arachnid robot dies, it explodes in a burst of plasma. Each creature within 5 feet of it must make a DC 11 Dexterity saving throw, taking 7 (2d6) fire and lightning damage on a successful one. Fragile. 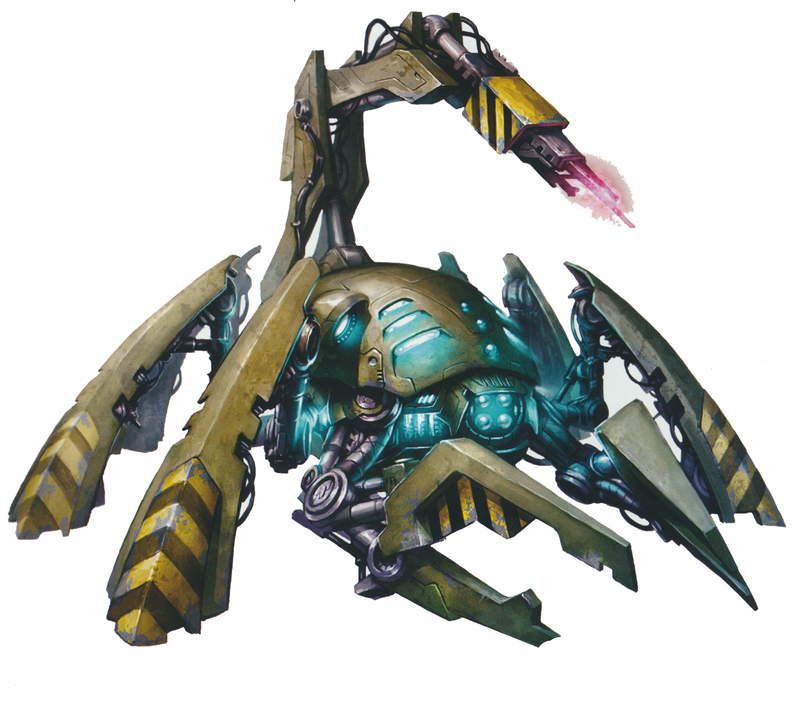 When the arachnid robot is reduced to less than 11 hit points, it suffers disadvantage on all ability checks and attack rolls. Vulnerable to Critical Hits. When the arachnid robot is hit with a critical hit, it must make a DC 15 Constitution saving throw or be stunned for 1 round. Multiattack. The arachnid robot makes two claw attacks. Claw. Melee Weapon Attack: +3 to hit, reach 5 ft., one target. Hit: 3 (1d4 + 1) bludgeoning damage. Plasma Spray. The arachnid robot exhales a 15-foot cone of plasma. Each creature in that area must make a DC 11 Dexterity saving throw, taking 7 (2d6) fire and lightning damage on a failed save, or half as much damage on a successful one. Plasma Torch. Ranged Weapon Attack: +5 to hit, range 15/45, one target. Hit: 8 (2d6 + 1) fire and lightning damage. Foster’s Cantrips are Fire Bolt, Light, Mage Hand, Shocking Grasp. Foster can prepare 11 magus spells daily. Foster’s Spellbook (his Wizard spells are in bold). First Level spells are Detect Magic, Detect Radiation, Fog Cloud, Silent Image, Technomancy. Second Level spells are Invisibility, Levitate, Scorching Ray, Web. Third Level spells are Fireball, Fly, Haste, Leomund’s Tiny Hut, Lightning Bolt, Magic Circle, Recharge, Water Breathing. Fourth Level spells are Arcane Eye, Conjure Minor Elementals, Fabricate, Polymorph, Remove Radioactivity. The DC to resist your spells is DC 17 (8 + proficiency bonus + your intelligence modifier). 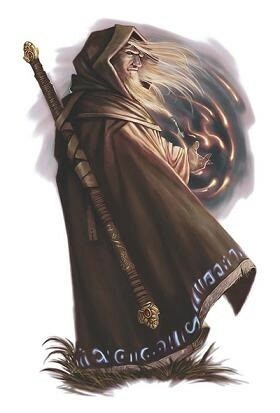 Spellstrike: Whenever Foster casts a magus spell or cantrip that requires a melee attack roll, he can deliver the spell through his bonded weapon instead. To do so, he takes the Attack action with a melee weapon and simultaneously casts any magus spell he has prepared or magus cantrip he knows as a bonus action. If he hits, the melee weapon attack deals its normal damage as well as the effects of the spell. If he rolls a critical hit, the spell damage is doubled. Spellstrike can be used once per round. Spell Combat: Once per round, when he takes the Attack action, Foster can cast any non-cantrip magus spell that he has prepared as a bonus action, either before or after the Attack. If the spell is a ranged attack that would suffer Disadvantage on the attack, he can make a DC 10 Constitution check as part of the bonus action to make the ranged attack normally. Arcane Pool: Foster has 14 points in his Arcane Pool. He regains all Arcane Pool points when he completes a long rest. 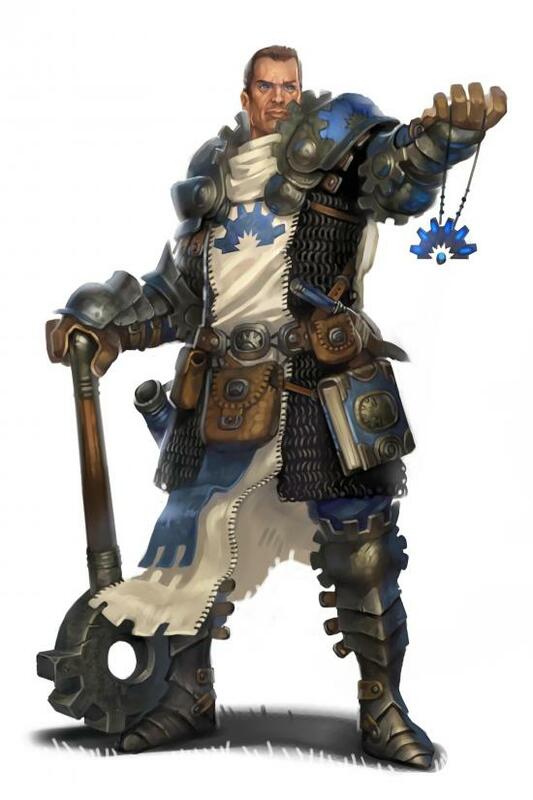 He can expend points from his Arcane Pool as a bonus action to grant any nonmagical weapon he are holding, or his bonded weapon, a bonus to hit and damage rolls and transform the weapon into a magic weapon for a duration of Concentration, up to 1 minute. The bonus to hit and damage depends on the amount of Arcane Pool points spent, as follows. Sword Magus: Foster can use his Arcane Pool abilities with magic weapons. When he does so, his Arcane Pool ability supersedes the weapon’s bonuses and abilities for the duration of the Arcane Pool ability. Spell Recall: Foster may transform unspent Arcane Pool points into one spell slot as a bonus action on his turn. The table below shows the costs of creating a spell slot of a given level. Extra Attack: Foster can attack twice when he takes the Attack action. 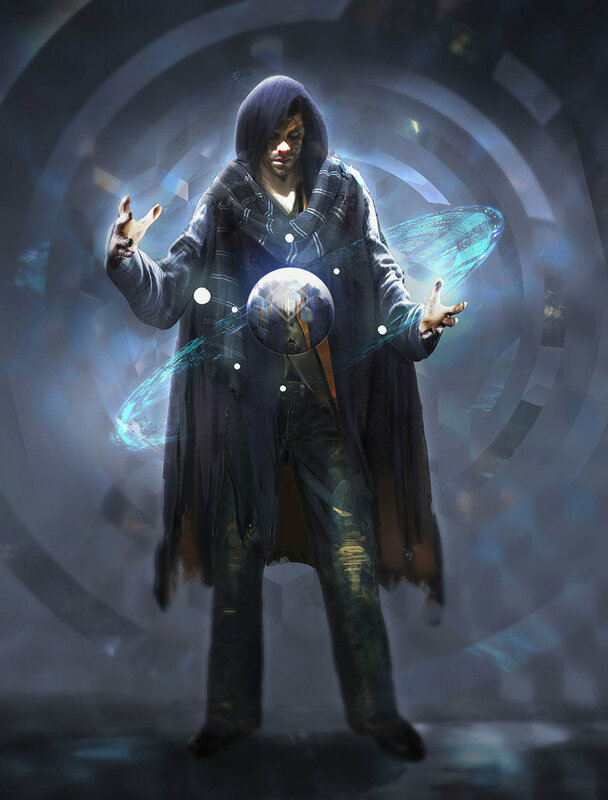 Knowledge Pool: As an action, Foster can transform unexpended Arcane Pool points to cast one spell from the magus spell list as if he had prepared that spell, whether he has that spell prepared or not. The table below shows the costs of casting a spell of a given level. Familiar: Foster knows the find familiar spell and can cast it as a ritual. Mystic Arcanum: Foster can cast the delayed blast fireball spell without expending a spell slot. He must finish a long rest before he does so again. Quickened Magic: When Foster casts a spell that has a casting time of 1 action, he can expend 2 points from his Arcane Pool to change the casting time to 1 bonus action for this casting. Cold Bringer: A +1 rapier that was originally crafted for an elite commander of a Dresden armed forces. It grants the wielder resistance to Cold and allows the wielder to understand and read the Dresden language. A weapon that has the Autofire property can be used to fire a hail of shots at your enemies in two different ways, each of which takes your Action. The first is to cover a 10ft radius area with a hail of lead. Make an attack roll and all targets in the area must make a Dexterity save against the result of your attack or take weapon damage (without adding your ability modifier) on a failed save, or half damage on a successful save. This attack uses 10 shots. The second is to focus fire on a single target. Make an attack roll and, if you hit, add two extra damage dice to your damage roll. For example, if you hit a target with this attack using a Laser Rifle, you roll 4d10 fire damage. This attack uses 5 shots. A weapon with the laser property passes through force fields and force effects, such as the wall of force spell. Objects like glass or other transparent barriers do not provide cover from lasers, but unlike force barriers, a transparent physical barrier still takes damage from a laser passing through it. Invisible creatures are immune to damage caused by a laser weapon. Fog, smoke, and other clouds provide cover in addition to concealment from laser attacks. Damage: 1d12 radiant, Weight: 2 lbs., Properties: Ammunition (range 50/200), Laser, Semi-Automatic, Reload (Capacity: 10, 1 charge per use). Damage: 2d10 radiant, Weight: 6 lbs., Properties: Ammunition (range 150/600), Automatic, Laser, Reload (Capacity: 20, 1 charge per use). While inactive, smart armor resembles a breastplate of adamantine scales, which doesn’t seem out of place among most metal armor, except for its alien aesthetics. When activated as a Reaction, smart armor expands to cover the wearer’s legs and limbs, and a built-in magnetic generator hardens the armor into a rigid, plate-like form. 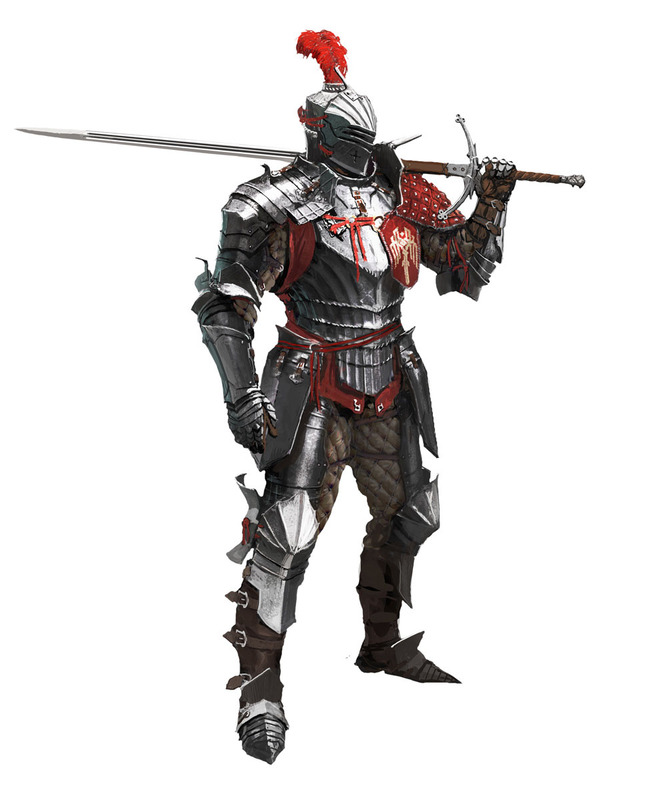 When in this form, it uses the statistics of smart armor (expanded form). It can be collapsed back to breastplate form with a bonus action, and automatically retracts when it loses power. In either form, smart armor reduces bludgeoning, piercing, slashing from nonmagical weapons that aren’t adamantine by 2. Damage: 2d10 thunder, Weight: 6 lbs., Properties: Ammunition (range 150/600), Automatic, Reload (Capacity: 20, 1 charge per use). A sonic rifle emits a blast of devastating sonic waves that shatter and blast flesh, bone, and anything else they happen to strike. A target critically hit by a sonic rifle must succeed at a DC 13 Constitution saving throw or be deafened. The deafened condition does not heal naturally and must be cured by a lesser restoration or a similar ability. A grenade is a small, cylindrical device that is designed to be thrown as a ranged finesse weapon at a point up to 60 feet away or fired from a grenade launcher. Before being thrown by hand, the grenade must be primed with a quick twist of a dial at one end and then armed with a click of a button at the center of that dial. Priming and arming a grenade is done as part of the Attack action; a grenade launcher primes and arms all grenades it fires. The grenade detonates at the beginning of the wielder’s next turn, hopefully in the area targeted. When a grenade detonates, it damages all targets within a 20 feet of the grenade. Deals no damage but blinds creatures for 1d4 rounds if they fail a DC 15 Dexterity saving throw. An e-pick (short for “electronic lock pick”) is a small device that can be used to unlock and disable electronic locks and devices, much in the same way that a set of thieves’ tools can be used to dismantle mechanical locks and devices. The bonus is determined by the rating of the e-pick. A Green E-Pick grants +4 to all checks. Using the device does not grant proficiency with thieves tools, but allows the user to make rolls against electronic devices without disadvantage. If you are proficient with Engineer’s Tools, you may also add your proficiency bonus to checks when using an e-pick. A black veemod enhances vision, and by blinking twice rapidly, the wearer can magnify what she’s seeing. Blinking twice again restores normal vision. This grants advantage on Wisdom (Perception) checks. Ion tape is a ribbon of material tightly wound around a spindle. A roll of ion tape fits in the palm of a hand and comes in a wide range of colors. A single roll contains 50 feet of tape. A single strip of tape is easy to cut through or tear. When wrapped around an object, it has a weak adhesive that keeps it in place. When ion tape is exposed to an electrical charge of any power (including a jolt from a zip stick), the tape bonds together into a single mass of plastic-like material, gaining AC 15 and 30 hit points. When used to bind a creature, a few strips of activated ion tape require a successful DC 20 Strength check to break. A second jolt from an electrical source causes the tape to revert to its weaker ribbon condition, at which point it can be torn free easily. A strip of ion tape can hold about 5 pounds of weight normally, but when activated via a jolt, a single hardened strip can support up to 300 pounds of weight. The uses for ion tape are many—it can be used to construct basic objects (such as a ladder), patch holes, bind prisoners, and so on. A zipstick is a small pen-like device used to administer a small jolt of electricity. This jolt is enough to cause 1 point of lightning damage with a successful melee attack. A zipstick is used most often to activate or deactivate items that function on ion-bonding technology, such as ion tape. One of the unique elements that makes the Iron Gods adventure path so fun is the crap-ton of exotic, high technology featured throughout. From laser guns, to force fields, to chainsaw swords, there is a wide selection of sci-fi loot that can be recovered from ancient Numerian ruins, purchased from friendly scavengers, or pried from the cold, dead hands of vanquished foes and, since these items play such a significant role in setting the tone for the Iron Gods adventure path 5E versions of these items are a necessity. The following are a few new high tech items that I recently converted for a series of short fantasy/horror/sci-fi adventures. At cleric level 7, you know 4 cleric cantrips. Beradin knows the Guidance, Mending, Sacred Flame, and Thaumaturgy cantrips. 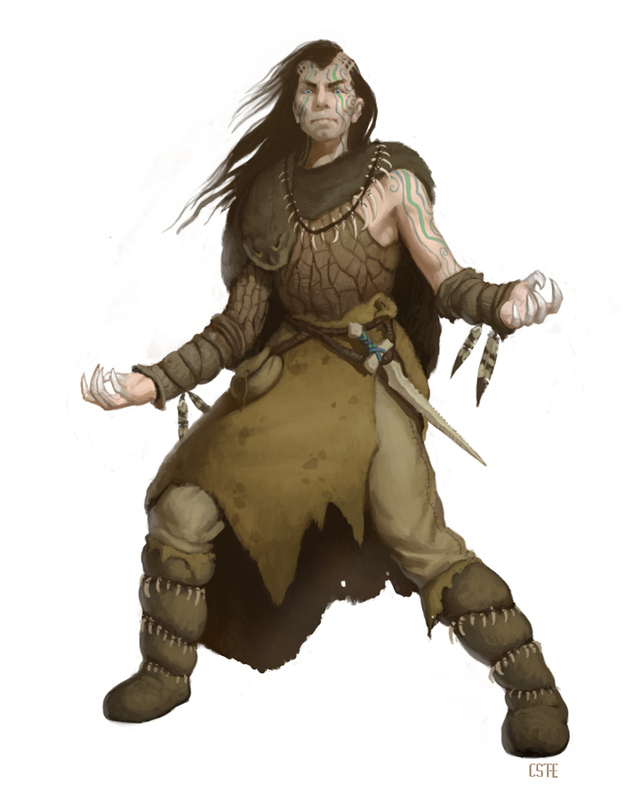 Beradin’s level and wisdom allow him to prepare 11 Cleric spells daily, in addition to his domain spells. You can find a welcome and protection from ordinary people as long as you are decent. The DC to resist your spells is 15 (8 + proficiency bonus + your wisdom modifier). When using a spell to restore hit points, recipient regains 2 + the spell level hit points. Level 2: Channel Divinity — Preserve Life. Distribute 25 (5 x your level) hit points to creatures within 25 feet who are at half hit points or below. When you cast a spell of 1st level or higher that restores hit points to a creature other than you, you regain hit points equal to 2 + the spell’s level. 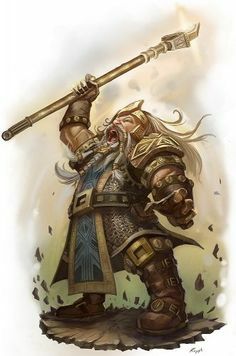 Wyrm’s Breath Bitter: This pungent and bitter beer forces the imbiber to make a DC 13 Constitution saving throw or be poisoned for 1 minute (Dwarf characters have advantage on this saving throw, thanks to their Dwarven Resilience trait). For 1 minute after consuming this ale, the imbiber can use a bonus action to unleash a thunderous and noxious belch, which causes all creatures in a 10ft cone to make a DC 13 Constitution saving throw or be poisoned and deafened. Those targets affected by the belch can make a new saving throw at the end of their turn to end the poisoned and deafened conditions. After three belches, the poisoned effect on the imbiber immediately ends and he can no longer belch (at least not to cause poisoning and deafness). Kobold Glue Pot: Each creature within 10ft of bomb’s target must succeed on a DC 11 Dexterity saving throw or be restrained. The target or another creature within reach of it can use an action to make a DC 11 Strength check; if the check succeeds, the effect on the target ends. Beradin Toraktaalomar’s Personality Traits: If someone is in trouble, I’m always ready to lend a hand. Beradin Toraktaalomar’s Ideal: Sincerity: There’s no good in pretending to be something I’m not. Beradin Toraktaalomar’s Bond: I protect those who can’t protect themselves. Beradin Toraktaalomar’s Flaw: I put too much trust in my church’s hierarchy. Antimagic Susceptibility. The armor is incapacitated while in the area of an antimagic field. If targeted by a dispel magic, the armor must succeed on a Constitution saving throw against the caster’s spell save DC or fall unconscious for 1 minute. False Appearance. While the armor remains motionless, it is indistinguishable from a normal suit of armor. Multiattack. The armor makes two slam attacks. Slam. Melee Weapon Attack: +4 to hit, reach 5 ft., one target. Hit: 1d6+2 bludgeoning damage. At magus level 5, Carrick knows 3 magus cantrips. Carrick can prepare 5 magus spells daily. You can exert influence and gain benefits from your military contacts. The DC to resist your spells is DC 14 (8 + proficiency bonus + your intelligence modifier). 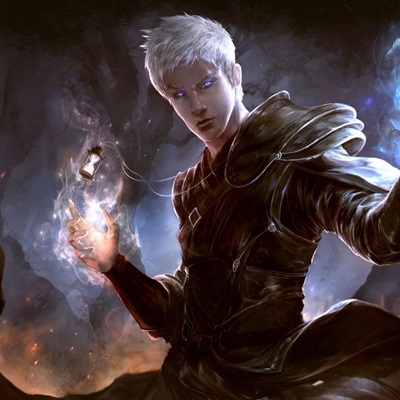 Spell Combat: Once per round, when Carrick takes the Attack action, he can cast any non-cantrip magus spell that you have prepared as a bonus action, either before or after the Attack. If the spell is a ranged attack that would suffer Disadvantage on the attack, Carrick can make a DC 10 Constitution check as part of the bonus action to make the ranged attack normally. Arcane Pool: Carrick has 5 points in his arcane pool. Carrick regains all arcane pool points when you complete a long rest. 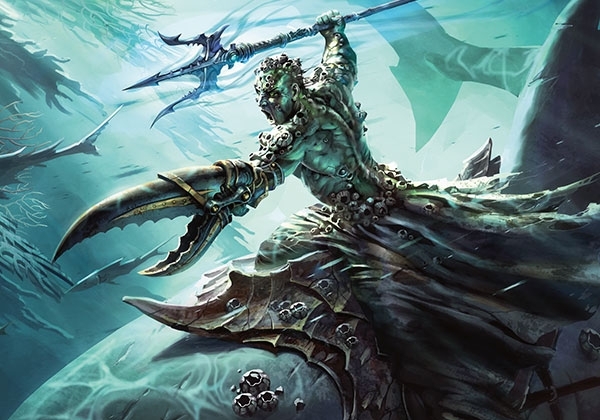 Carrick can expend points from his arcane pool as a bonus action to grant any nonmagical weapon he is holding a bonus to hit and damage rolls and transform the weapon into a magic weapon for a duration of Concentration, up to 1 minute. The bonus to hit and damage depends on the amount of arcane pool points spent, as follows. 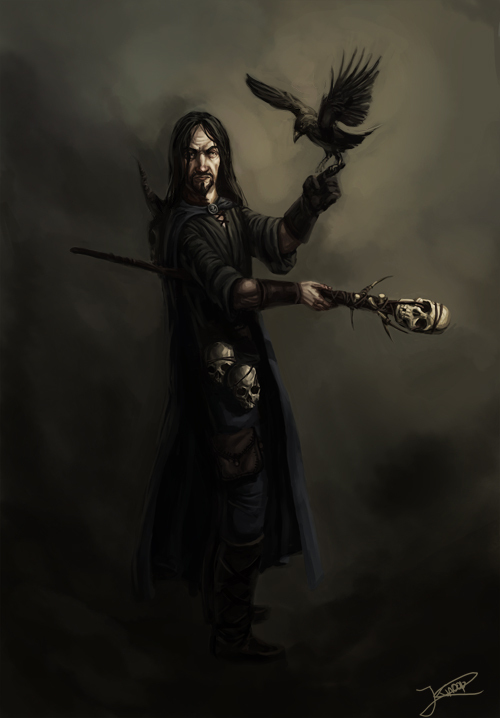 Spellstrike: Whenever Carrick casts a magus spell or cantrip that requires a melee attack roll, he can deliver the spell through his bonded weapon instead. To do so, he takes the Attack action with a melee weapon and simultaneously cast any magus spell he has prepared or magus cantrip he knows as a bonus action. If he hits, the melee weapon attack deals its normal damage as well as the effects of the spell. If Carrick rolls a critical hit, the spell damage is doubled. Spellstrike can be used once per round. Armored Magus: Carrick is proficient with medium armor. 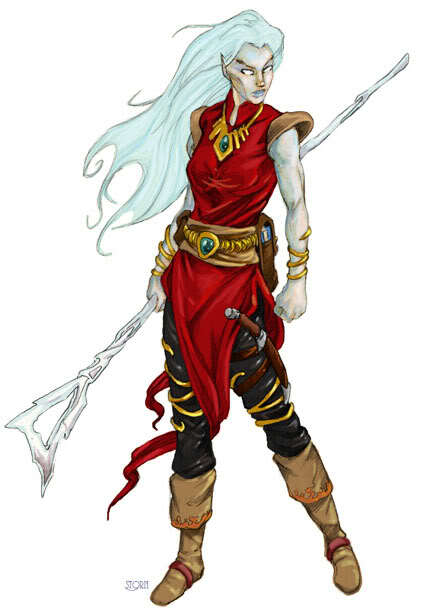 Thaeriel Bitterleaf: Moon Elf Magus who roams the Sword Coast, overseeing agents of the Misty Kingdom and liasing with other allied organizations– Contact Bond Level 2. At fighter level 8, as a battle master you know 5 maneuvers. Check your chosen maneuvers here. Disarming Attack – When he hits a creature with a weapon attack, Diero can spend 1 Sup die to attempt to disarm. Add sup die to damage roll and target makes Str save DC 14 or drop an object carried to its feet. Distracting Strike. 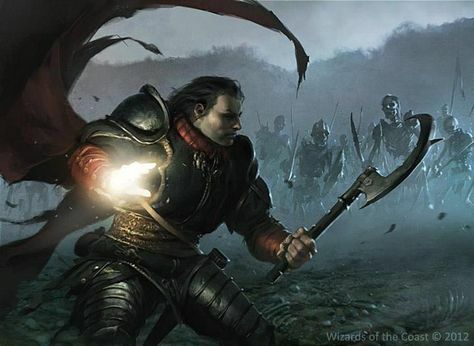 When Diero hits a creature with a weapon attack, Diero can expend 1 Sup die to add the Sup die to damage and the next attack against the target by another attacker gains advantage if it is made before the start of your next turn. Pushing Attack. When Diero hits a target with a weapon attack, he can expend 1 Sup die to add it to damage and, if the target is Large or smaller, it must make a Str saving throw or be pushed up to 15 feet away. Second Wind: As an action, regain hit points equal to 1d10+6 (1d10 + your fighter level). Once per period between short rests. Level 3: Combat superiority — five d8 superiority dice, five maneuvers. Level 7: Know Your Enemy – If you spend 1 minute observing or interacting with a creature outside of combat you get to learn whether the creature is your equal, superior, or inferior to you in tow of the following characteristics: Strength, Dexterity, Constitution, Armor Class, Current hit points, Total class levels, or Total fighter levels. Kelvalos has at least 14 wizard spells in your spellbook and he can prepare 9 Wizard spells per day. 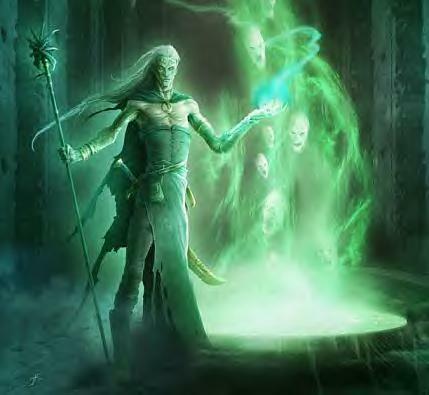 Kelvalos’s First Level spells are Comprehend Languages, Detect Magic, Expeditious Retreat, Feather Fall, Identify, Illusory Script, Mage Armor, Unseen Servant, and Witch Bolt. Kelvalos’ Second Level spells are Blur, Detect Thoughts, Flaming Sphere, Invisibility, and See Invisibility. Kelvalos’ Third Level spells are Counterspell and Haste. Abjuration spells are in bold. You know at least where to find almost any piece of information. The DC to resist your spells is DC 15 (8 + proficiency bonus + your intelligence modifier). Arcane Recovery: Once per day, recover expended spell slots (level 6 or under) up to half your wizard level (3). Level 2: Arcane ward — casting abjurations generates a barrier that absorbs 14 hit points of damage for you. Recharges when you cast another abjuration. The Darkfrost Ring: Made of smooth white marble, this ring resizes itself to fit the wearer’s finger as if made for the wearer all along. The carvings along the ring depict the faces of deep gnome heroes wreathed in stylized fur. Functions as a Ring of Cold Resistance (1/2 damage from Cold) and it allows the wearer to use an action to cause his voice to carry clearly for up to 300 feet until the end of the wearer’s next turn. Kelvalos Stormwind’s Personality Traits: I have read every book in Candlekeep – or I like to boast that I have. Kelvalos Stormwind’s Ideal: No Limits: Nothing should fetter the infinite possibility of existence. Kelvalos Stormwind’s Bond: I am a book buyer for Candlekeep. Kelvalos Stormwind’s Flaw: I am easily distracted by the promise of new info. Level 2: Eight (8) ki points — ki points renew upon making a short rest. Level 3: Deflect missiles – use your reaction to reduce damage of missiles by 1d10+8. If reduced to zero, spend 1 ki point to make a ranged weapon attack as part of the same reaction. Level 5: Stunning Strike – When Malark hits another creature with a melee weapon attack, he can spend 1 ki point to attempt a stunning strike. The target must make a DC 13 Constitution saving throw or be stunned until the end of Malark’s next turn. Level 6: Your unarmed strikes count as magical for the purpose of overcoming resistance and immunity to nonmagical attacks and damage. Level 7: Evasion – When you are subjected to an effect that allows you to make a Dexterity saving throw to take only half damage, you instead take no damage if you succeed on the saving throw, and only half damage if you fail. Level 7: Stillness of Mind – You can use your action to end one effect on yourself that is causing you to be charmed or frightened. Level 3: You know two Martial Arts Forms. 1 – Two attacks against two different targets and pick a third. The third target has disadvantage on attacks against you. 2 – Three attacks against three targets. One of those targets takes disadvantage on all attacks and saves until the start of your next turn. 3 – At the cost of 3 ki, make six melee attacks against a single target, who must succeed in Str saving throw vs your Athletics roll or suffer disadvantage on all attacks and saves until it is out of your melee range. 1 – You remain adjacent to your defended ally, make two attacks and all attacks against your ally suffer disadvantage. 2 – You make attacks as normal, but you may sacrifice any attack available to reduce damage done to your guided ally or yourself by the amount of damage your attack would do. Attacks against you and your ally suffer disadvantage. 3 – At the cost of 2 ki, all targets within 10 ft must make contested roll against your Athletics. If they fail the roll, they take 4d6 bludgeoning and are knocked back 10ft. If they succeed, they take 2d6 bludgeoning and are not pushed back. Malark Buckman’s Personality Traits: Thinking is for other people. I prefer action. Malark Buckman’s Ideal: Respect: People deserve to be treated with dignity and respect. Malark Buckman’s Bond: I protect those who cannot protect themselves. Malark Buckman’s Flaw: Too tall and bad temper. Trampling Charge. If Chomper moves at least 20 feet straight towards a creature right before hitting it with a hooves attack, the target must succeed on a DC 14 Strength saving throw or be knocked prone. If the target is prone, Chomper can take a bonus action to make another attack with its hooves against the target. Hooves. Melee Weapon Attack: +4 to hit, reach 5 ft., one target. Hit: 2d6+4 bludgeoning damage. At warlock level 7, you know 3 warlock cantrips. Maurgoth’s cantrips are Eldritch Blast, Friends, and True Strike. Maurgoth has 2 Fourth-level spell slots, which regenerate on a short rest. At warlock level 7, Maurgoth knows 8 warlock spells. Maurgoth’s spells are Command, Counterspell, Dimension Door, Fireball, Fly, Hex, Invisibility, and Wall of Fire. At warlock level 7, Maurgoth knows 4 warlock invocations. Mask of Many Faces – Maurgoth can cast disguise self without expending a spell slot (see spell in his spellbook). One With Shadows – When Maurgoth is in an area of dim light or darkness, he can use his action to become invisible until he moves or takes an action or a reaction. The breath weapon does 3d6 fire damage in 15ft cone. A short rest is required to recharge. Breath weapon is a 15 foot cone of fire, dexterity saves at DC 13. Red dragonborn are resistant to fire. You have a fake identity alter-ego. The DC to resist your spells is 14 [8 + proficiency bonus + your charisma modifier]. Dark Ones Blessing — on reducing enemy to 0 hp, gain temporary hp equal to your charisma modifier plus warlock level (9 hps). Dark One’s Own Luck – When you make an ability check or a saving throw, you can use this feature to add a d10 to your roll. You can do so after the initial roll but before any of the roll’s effects occur. Once you use this feature, you can’t use it again until you finish a short or long rest. Vivexvalignant – (Attunded) This greatsword is a 5 1/2 foot long blade of oily, dark-gray iron named Vivexvalignant (“Burning Victory”). The hilt is a soot-stained representation of two black dragon heads rearing towards each other, and the hilt is wrapped in alchemically treated reptile skin. It functions as a +1 Greatsword that grants the wielder resistance to acid, the wielder can understand spoken Draconic, those creatures hit with the blade are unable to heal for 1 round, and the wielder can cast the spell Compelled Duel once per day, when attuned. Otherwise, it is simply a +1 Greatsword. Cinderstrong Bands: These vambraces are made of a blackened iron that appears coated in soot that does not rub off. The leather straps on the back seem, likewise, charred. The vambraces feature the wrought iron faces of demonic, horned humanoid creatures wreathed in stylized flames in a distinctly ancient style reminiscent of the lost Calim Empire (which fell 7000 years ago). Along the edges, they feature the crude runic script of the Ignan tongue (a subset language of Primordial…the language of the inhuman elemental planes). When the Cinderstrong Bands are worn, the wearer’s Strength is 19. They require attunement. Backpack, Gaming set (proficient), Ink pen, Ink vial, Mess kit, Parchment sheets x10, Rations (1 day) x10, Rope (50′, hempen), Tinderbox Waterskins, Disguise kit (proficient), Wand, and Book of Lore. Maurgoth Son of Daurgoth’s Personality Traits: I lie about almost everything, even when there is no reason to do so. 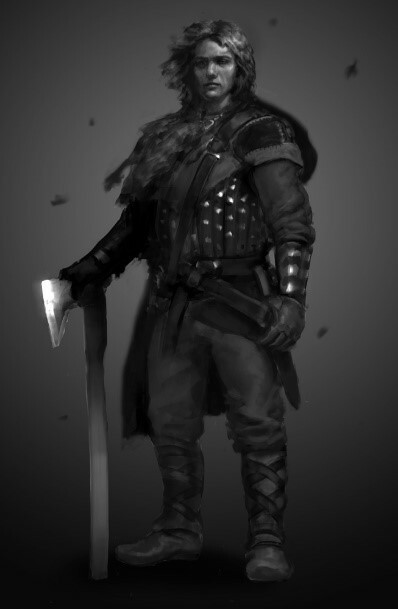 Maurgoth Son of Daurgoth’s Ideal: Independence: I am a free spirit – no one tells me what to do. 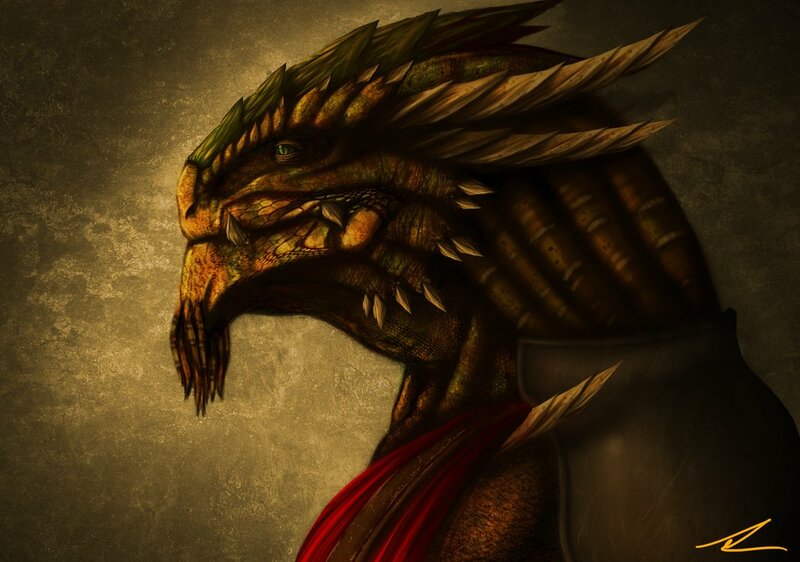 Maurgoth Son of Daurgoth’s Bond: Wanted by his father the Dracolich after he betrayed him. Maurgoth Son of Daurgoth’s Flaw: Can’t resist swindling more powerful beings. 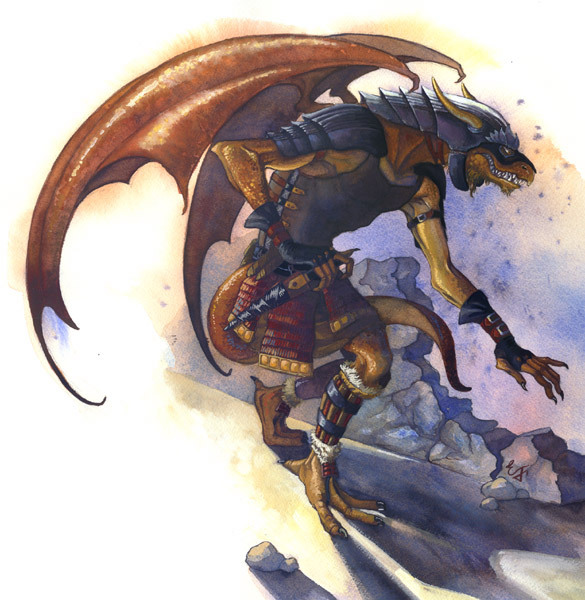 Veygauth: Dragonborn Illusionist who is one of the favoured children of Daurgothoth. 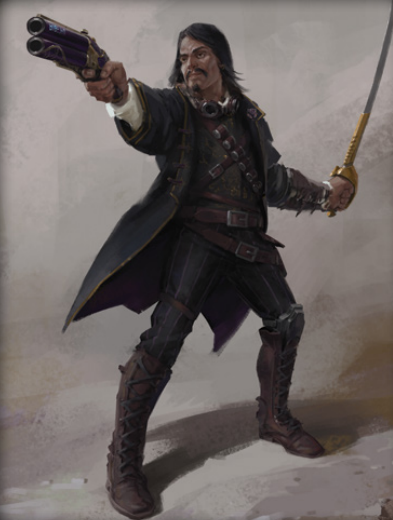 Mostly based out of Waterdeep, where he poses as a human who repairs and crafts stringed musical instruments– Contact Bond Level 2. Speed 30 ft., fly 30 ft.
Sunlight Sensitivity. While in sunlight, Arvoul has disadvantage on attack rolls, as well as on Wisdom (Perception) checks that rely on sight. Pack Tactics. Arvoul has advantage on an attack roll against a creature if at least one of Arvoul’s allies is within 5 feet of the creature and the ally isn’t incapacitated. Dagger. Melee Weapon Attack: +5 to hit, reach 5 ft., one target. Hit: 1d4+3 piercing damage. Dropped Rock. Ranged Weapon Attack. +5 to hit, one target directly below Arvoul. Hit: 1d6+3 bludgeoning damage. Fire Breath (Recharge 5-6). Arvoul exhales fire in a 15-foot cone. Each creature in that area must make a DC 13 Dexterity saving throw, taking 24 (7d6) fire damage on a failed save, or half as much damage on a successful one. Forest Gnomes know the Minor Illusion cantrip. 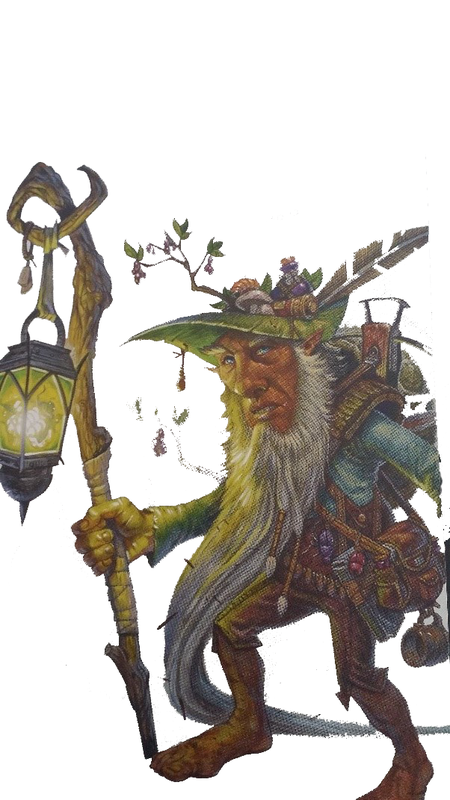 Wrenn Raulnor Turen Pock’s level and wisdom allow him to prepare 9 Druid spells daily. Forest Gnomes know the minor illusion cantrip and cast it using intelligence (see spellbook). Forest gnomes can communicate simple ideas with small / smaller beasts. You are from a wilderness community. You always have your bearings in unfamiliar territory, and can enable at least five companions to live off the land. The DC to resist your spells is DC 14 (8 + proficiency bonus + your wisdom modifier). Level 2: Wild shape (2x, regain uses with short rest); challenge raging 2, no fly. Valid Wild Shape Forms include: Badger, Cat, Frog, Lizard, Rat, Giant Crab, Giant Rat, Giant Weasel, Mastiff, Poisonous Snake, Boar, Constrictor Snake, Elk, Giant Badger, Giant Centipede, Giant Frog, Giant Lizard, Giant Poisonous Snake, Giant Wolf Spider, Riding Horse, Wolf, Black Bear, Crocodile, Warhorse, Brown Bear, Dire Wolf, Giant Spider, Giant Toad, Polar (Grizzly) Bear, Giant Boar, Giant Constrictor Snake, Giant Elk. Level 2: Combat Wild Shape — shape change is bonus action rather than action; may expend a spell slot to regain 1d8 hp/level of the slot expended. Level 2: Moon shapes — can have challenge rating one. Primal Strike: Your attacks in beast form count as magical for the purpose of overcoming resistance and immunity to nonmagical attacks and damage. Globe of Contemplation: An apple-sized sphere of smooth crystal that has tiny, smooth Elvish script carved across its surface, with three stylized leaves that serve as “legs” for the globe. The design and unusual design of the script suggest that the Globe was created by craftsmen from a fallen Elven kingdom (lost over 12,000 years ago). When the appropriate Elvish command word is spoken (Teu-iiri, Elvish for “moonlight”), it emanates light, as the Light spell. When the Elvish word for follow (Rluuth) is spoken, the illuminated Globe rises into the air and floats no more than 5ft off the ground. It follows the speaker around, maintaining a distance of no more than 20ft. While active in this manner, the Globe also provides some warning of danger to the speaker, granting +2 to initiative. When one stares into the illuminated globe, prophetic Elvish script in the same unusual style as the carvings along its surface appears, deep within the globe itself. Backpack, mess kit, rations (1 day) x 10, hempen rope 50’, tinderbox, 10 torches, waterskins, herbalist kit, holly and mistletoe, holy symbol, spell component pouch, fox head trophy, and black dragon embryo head. Wrenn Raulnor Turen Pock’s Personality Traits: I’m driven by a wanderlust that led me away from home. Wrenn Raulnor Turen Pock’s Ideal: Change. Life is like the seasons, in constant change, and we must change with it. 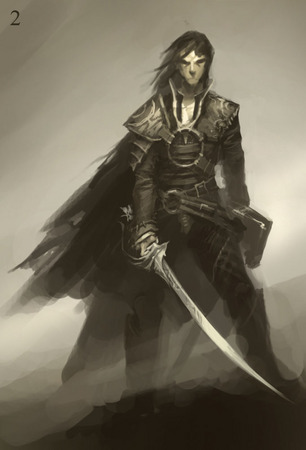 Wrenn Raulnor Turen Pock’s Bond: Searching for his lost half-elf friend, Talis. Wrenn Raulnor Turen Pock’s Flaw: There’s no room for caution in a life lived to the fullest. 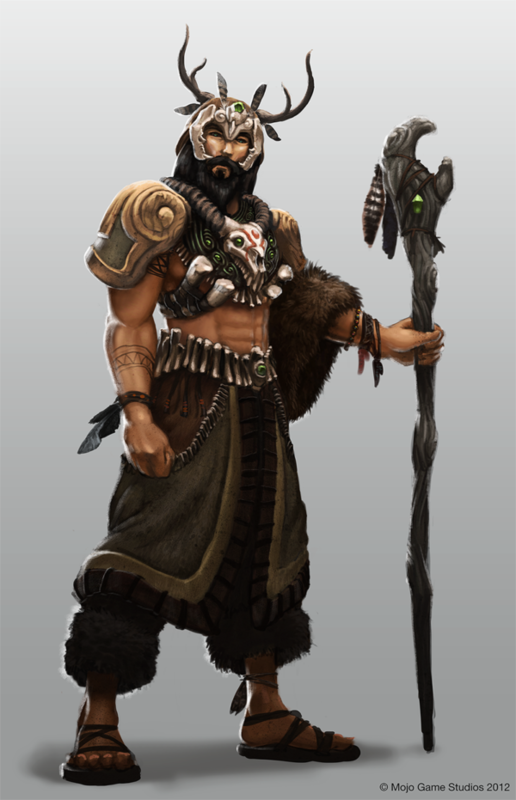 Greymane: Wemic Druid, who roams with his tribe, moving from the Shining Plains, to the Western Heartlands, to the Sword Coast– Contact Bond Level 2. To contact Greymane, you use the Animal Messenger spell to start a chain of messages that will eventually reach Greymane. You will receive a response from, and/or Greymane’s attendance, 2d6 days after the Messenger is sent. This weekend kicked off with a pair of episodes of the Live from the Sword Coast podcast; first is a short 5th Edition Dungeons & Dragons solo session featuring our campaign’s resident Dragonborn Warlock, Maurgoth, Son of Daurgothoth, and the second is our regularly scheduled Friday night game, playing the second session of our Deadlands: Hell on Earth detour in the Tyranny of Dragons campaign (the first of which can be viewed here). The following is a compilation of all the previous material I have posted for my conversion of the Pathfinder RPG Oracle class to 5th Edition Dungeons & Dragons. You can find discussion of these conversion here, in my initial post on the Oracle class. As an oracle, you gain the following class features. Hit Dice: 1d8 per oracle level. Hit Points at Higher Levels: 1d8 (or 5) + your Constitution modifier per oracle level after 1st. You are a divine vessel, granted power without your choice, selected by providence to wield powers that even you do not fully understand. See chapter 10 of the Player’s Handbook for the general rules of spellcasting and below for the divine spell list. At 1st level, you know four cantrips of your choice from the cleric spell list. You learn additional cleric cantrips of your choice at higher levels as shown in the Cantrips Known column of the Oracle table. The Oracle table shows how many spell slots you have to cast your spells of 1st level and higher. To cast one of these spells, you must expend a slot of the spell’s level or higher. You regain all expended spell slots when you finish a long rest. You know two 1st level spells of your choice from the cleric spell list. The Spells Known column of the Oracle table shows when you learn more cleric spells of your choice. Each of these spells must be of a level for which you have spell slots. For instance, when you reach 3rd level in this class, you can learn one new spell of 1st or 2nd level. 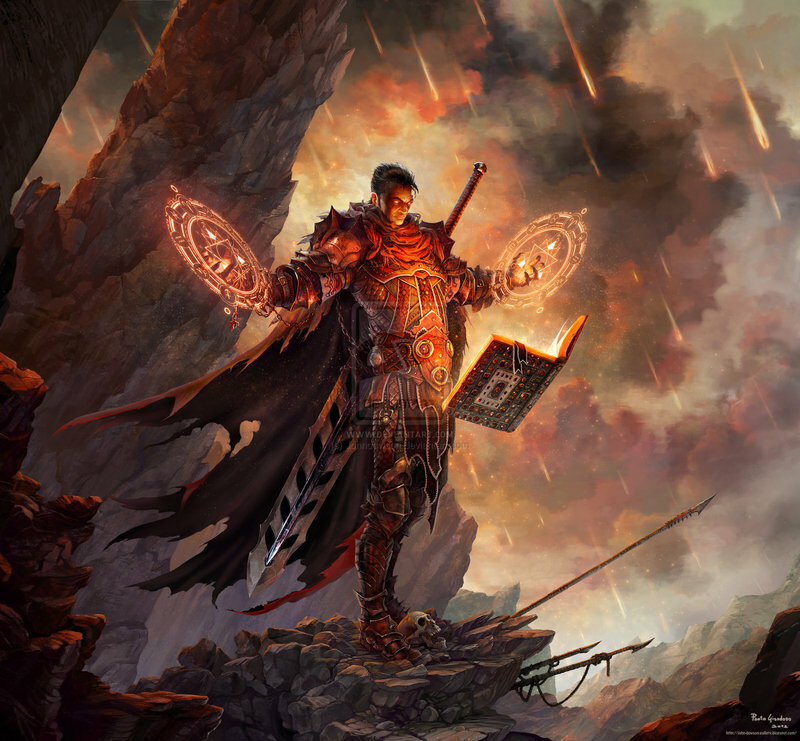 Additionally, when you gain a level in this class, you can choose to replace one of the cleric spells you know and replace it with another spell from the cleric spell list, which also must be of a level for which you have spell slots. In addition to the other spells you know at 1st level, you learn either the cure wounds spell or inflict wounds spell. You can use one of your choices of Spells Known to learn whichever spell you don’t pick, if you want to learn both spells. Charisma is your spellcasting ability for your oracle spells, since you learn your spells through dedicated study and memorization. You use your Charisma whenever a spell refers to your spellcasting ability. In addition, you use your Charisma modifier when setting the saving throw DC for an oracle spell you cast and when making an attack roll with one. You can use a divine focus (found in chapter 5 of the Player’s Handbook) as a spellcasting focus for your cleric and mystery spells. At 1st level, you suffer a curse that come with a benefit, as well as a hindrance. Your curse cannot be removed or dispelled without the aid of a God. Choose one of the following options. Your eyes are obscured, making it difficult for you to see. Starting at 1st level, you cannot see anything beyond 30 feet, but you gain darkvision to that range. At 5th level, the range of your darkvision extends to 60 feet. At 11th level, you gain blindsight out to a range of 30 feet. Starting at 15th level, you gain the ability to cast true seeing without expending a spell slot, though you must complete a short rest before using this ability again. Starting at 1st level, you cannot hear and suffer all the usual penalties for being deafened, though your spells no longer require a verbal component. At 5th level, you gain advantage on any Wisdom (Perception) ability checks that don’t involve hearing. Beginning at 11th level, you gain tremorsense to a range of 30 feet. Starting at 15th level, you gain the ability to cast detect thoughts at will, without casting a spell slot. Starting at 1st level, you begin to be followed by malevolent spirits wherever you go, causing minor mishaps and strange occurrences (such as unexpected breezes, small objects moving on their own, and faint noises). You cannot interact with one object or feature of the environment for free (see page 190 of the Player’s Handbook) and must always spend your Action to Use an Object and any object you drop ends up 10 feet away from you. You also learn the mage hand and minor illusion cantrips. At 5th level, you add levitate and silent image to your list of known spells. When you reach 11th level, you add the telekinesis spell to your list of known spells. It does not count against the number of spells you know. At 15th level, you add the reverse gravity spell to your list of known spells. None of these spells count against the number of spells you know. At 1st level, one of your legs is permanently wounded, reducing your speed to 20 feet, though it is never reduced further by heavy armor or encumbrance. At 5th level, you gain advantage on all Constitution saving throws. When you reach 11th level, you can choose one damage type when you finish a short or long rest. You gain resistance to that damage type until you choose a different one with this feature. Damage from magical weapons or silver weapons ignores this resistance. At 15th level, you become immune to exhaustion and do not gain exhaustion levels. Starting at 1st level, in times of stress or unease, you speak in tongues. Pick one of the following languages: Abyssal, Celestial, Infernal, or Primordial. Whenever you are in combat, you can only speak and understand the selected language. This does not interfere with spellcasting, but it does apply to spells that are language dependent. You learn the chosen language. At 5th level, you learn another language of your choice. When you reach 11th level, you gain the ability to understand all languages. At 15th level, you gain the ability to speak and understand all languages. At 1st level, your body begins slowly rotting away. You suffer disadvantage on all Charisma ability checks, apart from Charisma (Intimidation) checks. However, you also gain advantage on all Constitution saving throws against disease. At 5th level, you become immune to all diseases. When you reach 11th level, you gain immunity to poisons and the poisoned condition. Starting at 15th level, you gain the ability to cast regenerate without expending a spell slot, though you must complete a long rest before using this ability again. At 1st level, you choose a mystery related to your deity: Ancestors, Battle, Bones, Dark Tapestry, Flame, Heavens, Life, Lore, Lunar, Metal, Nature, Solar, Stone, Time, Waves, Wind, and Wood. Each mystery is detailed at the end of the class description. 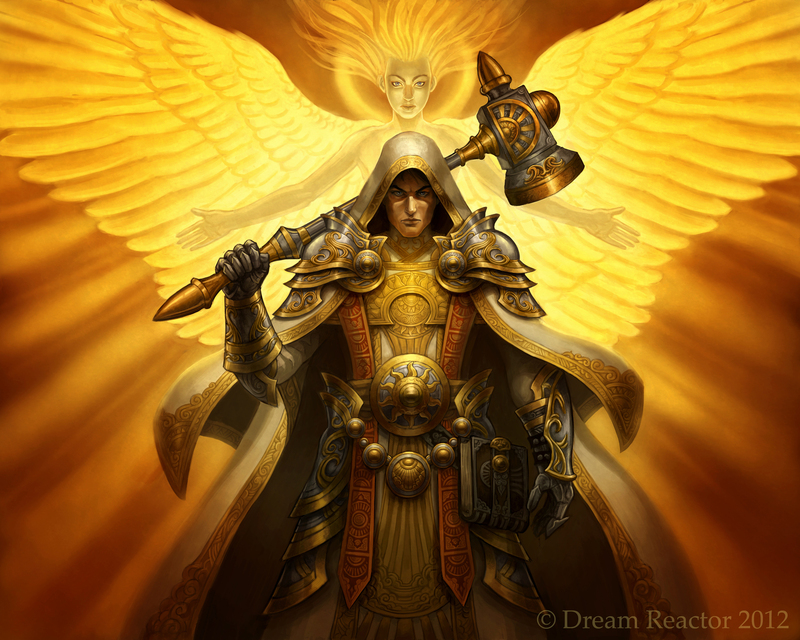 Your choice grants you mystery abilities, mystery spells, and additional abilities called revelations, at level. The tradition you choose grants you features at 1st level and again at 2nd, 3rd, 6th, 10th, 14th, and 18th level. At 2nd level, you gain one revelation of your choice, selected from the revelations available in your chose mystery. The revelations are detailed at the end of the class description. When you gain certain oracle levels, you gain additional revelations of your choice, as shown in the Revelations Known column of the Oracle table. Additionally, when you gain a level in this class, you can choose one of the revelations you know and replace it with another revelation that you could learn at that level. At 20th level, you become an avatar for your deity, gaining a new ability determined by the mystery you chose. Each mystery’s description includes the spells you learn at each level and the revelations you can choose. When you choose this mystery at 1st level, you gain proficiency with the History skill and with one Language. As an oracle with the Ancestor Mystery, you can choose from the following revelations. You gain the ability to summon a simple or martial weapon appropriate to your family’s history as a bonus action. You are proficient with this weapon. The weapon is treated as a magical weapon and remains for up to 1 minute. Once you use this ability, you must complete a long rest before using it again. At 10th level, your weapon gains the benefit as if you had cast the elemental weapon spell on it. You gain the ability to cast the heroism spell without using a spell slot. Once you use this ability, you must complete a long rest before using it again. You can use this ability twice per long rest at 10th level, and three times per long rest at 18th level. You learn the vicious mockery cantrip. You gain the ability to cast the bless spell without using a spell slot. Once you use this ability, you must complete a long rest before using it again. You can use this ability twice per long rest at 10th level, and three times per long rest at 18th level. You gain the ability to cast the crusader’s mantle spell without using a spell slot. Once you use this ability, you must complete a long rest before using it again. You can use this ability twice per long rest at 18th level. You gain the ability to cast the stoneskin without using a spell slot. Once you use this ability, you must complete a long rest before using it again. You can use this ability twice per long rest at 18th level. You gain the ability to use your action to become both incorporeal and invisible. While incorporeal, you gain resistance to acid, cold, fire, lightning, thunder, as well as bludgeoning, piercing, and slashing nonmagical weapon damage, and you are immune to poison damage. While you are incorporeal, you can move through other creatures and objects as if they were difficult terrain. You take 1d10 force damage if you end your turn inside an object. This effect lasts for as long as you maintain your concentration, up to 1 minute. Once you use this ability, you must complete a long rest before using it again. You can use this ability twice per long rest at 18th level. You gain the ability to cast the spirit guardians without using a spell slot. Once you use this ability, you must complete a long rest before using it again. You can use this ability twice per long rest at 18th level. You gain the ability to cast the speak with dead spell without using a spell slot. Once you use this ability, you must complete a long rest before using it again. You can use this ability twice per long rest at 18th level. You add the augury spell to your list of spells known. At 10th level, you add the commune and divination spells to your list of spells known. None of these spells count towards you limit of spells known. Advantage on all Wisdom saving throws. Once within that 1 minute, you can cast the astral projection spell as an action. Once you use this feature, you can’t use it again until you finish a long rest. 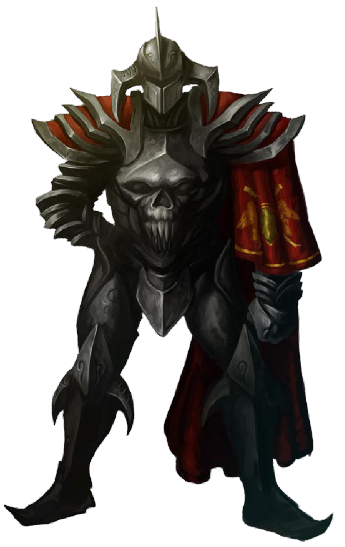 When you choose this mystery at 1st level, you gain proficiency in your choice of heavy armor or martial weapons. As an oracle with the Battle Mystery, you can choose from the following revelations. You gain the ability to rally others with an inspiring battlecry. To do so, you use a bonus action on your turn to choose one creature other than yourself within 60 feet of you who can hear you. That creature gains one Battle Inspiration die, a d6. Once, within the next 10 minutes, the creature can roll the die and add the number rolled to one ability check, attack roll, or saving throw it makes. The creature can wait until after it rolls the d20 before deciding to use the Battle Inspiration die, but must decide before the DM says whether the roll succeeds or fails. Once the Battle Inspiration die is rolled, it is lost. A creature can have only one Inspiration die, or any kind, at a time. You can use this feature a number of times equal to your Charisma modifier (a minimum of once). You regain any expended uses when you finish a long rest. Your Battle Inspiration die changes when you reach certain levels in this class. The die becomes a d8 at 6th level, a d10 at 14th level, and a d12 at 18th level. You gain the ability to reroll a failed saving throw as a reaction. You may wait until after you roll the saving throw, but must decide before the DM says whether the roll succeeds or fails. Once you use this ability, you must finish a long rest before using it again. You can use this ability twice per long rest at 10th level, and once per short rest at 18th level. You gain the ability to cast the cure wounds spell as a bonus action by using a spell slot one higher than the effect level. For example, you could cast cure wounds as a bonus action using a 3rd level spell slot to heal the target for 2d8 + your spellcasting ability modifier. You gain the ability to cast the stoneskin spell without using a spell slot. Once you use this ability, you must complete a long rest before using it again. You can use this ability twice per long rest at 14th level. You learn two maneuvers of your choice from among those available to the Battle Master archetype in the fighter class (at page 73 of the Player’s Handbook). If a maneuver you use requires your target to make a saving throw to resist the maneuver’s effects, the saving throws DC equals 8 + your proficiency bonus + your Strength or Dexterity modifiers (your choice). You have two superiority dice which are used to fuel that maneuver. This superiority dice is a d8. You may use superiority dice you gained from other classes to fuel these maneuvers. As a bonus action, you may convert spell slots into maneuver points, as in the table below, but you may not use the superiority dice generated from your spell points to fuel any other maneuvers. These maneuver points last until you complete a long rest. You gain advantage on all death saving throws. You gain proficiency in heavy armor or martial weapons. You gain the ability to move up to your speed as part of an Attack action. Once you use this ability, you must complete a short rest or long rest before using it again. You can use this ability twice per short rest at 10th level, and three times per short rest at 18th level. You gain advantage on initiative rolls. Starting at 18th level, you can roll three d20s when rolling for initiative and keep the highest. Choose one weapon with which you are proficient. You gain the ability to score a critical hit on a roll of 19 or 20 with that weapon. Starting at 18th level, you score a critical hit with your chosen weapon on a roll of 18-20. Whenever you make an Attack action, you can attack three times, instead of once. You gain resistance to bludgeoning, slashing, and piercing weapons. When you choose this mystery at 1st level, you gain the chill touch cantrip, if you don’t know it yet. As an oracle with the Bones Mystery, you can choose from the following revelations. You gain the ability to conjure armor made of bones that functions as the mage armor spell as a bonus action. At 14th level, the armor also provides resistance to bludgeoning weapon damage. Whenever a creature fails a saving throw and takes necrotic damage from one of your spells, it begins to bleed. The target takes 1d4 damage at the start of each of its turns. A creature can end this damage by using its action to make an Intelligence (Medicine) check to bind its wounds. The DC for this check is equal to your spellcasting save DC. You learn the ray of frost cantrip. You gain advantage on saving throws against charm effects, disease, and poison. At 10th level you gain the ability to reroll a failed death saving throw. Once you reroll a failed death saving throw in this manner, you may not do so again until you complete a long rest. You gain the Wizard class’ School of Necromancy ability, Undead Thralls, as described on page 119 of the Player’s Handbook. You gain resistance to necrotic damage and advantage on all saving throws against spells and effects that do necrotic damage. Starting at 14th level, you gain immunity to necrotic damage. You gain the ability to make a ranged spell attack against a single target within 30 feet. On a hit, the target takes 1d4 necrotic damage and you heal half as many hit points as the target takes damage (so, if the target is immune to necrotic damage, you heal nothing). This ability’s damage increased by 1d4 when you reach 6th level (2d4), 14th level (3d4), and 18th level (4d4). You add the etherealness spell to the list of spells you know. This does not count towards your limit of spells known. You gain the Wizard class’ School of Necromancy ability, Command Undead, as described on page 119 of the Player’s Handbook. You add the speak with dead spell to the list of spells you know. This does not count towards your limit of spells known. You automatically succeed in death saving throws. You can cast the animate dead spell without paying a material component cost. You can cast the power word kill spell without using a spell slot once. When you choose this mystery at 1st level, you gain the vicious mockery cantrip, if you don’t know it yet. As an oracle with the Dark Tapestry Mystery, you can choose from the following revelations. You gain the ability to violently probe the mind of a single intelligent enemy within 120 feet. The target makes a Wisdom saving throw and, on a failure, the target takes 1d4 psychic damage and you learn its surface thoughts. You can also make one Intelligence skill check with proficiency in a Skill the target has. Whether the target succeeds the saving throw or not, the target knows that you are probing its mind. This ability’s damage increases by 1d4 when you reach 6th level (2d4), 14th level (3d4), and 18th level (4d4). You gain the ability to conjure a cloak of shadowy armor that grants you an AC bonus equal to your proficiency bonus if you are not wearing armor and advantage on all Stealth checks. This ability has a duration of Concentration. You gain the ability to cast the phantasmal killer spell without expending a spell slot. Once you use this ability, you cannot use it again until you complete a long rest. At 18th level, you can use this ability to cast the weird spell instead of phantasmal killer. You gain the ability to use your action to cause a single creature within 60 feet to make a Wisdom saving throw or be affected by a confusion spell until the start of your next turn on a failed save. Starting at 14th level, a target that fails the Wisdom saving throw is affected by the confusion spell for 1 minute. At the end of each of its turns, the creature can make another Wisdom saving throw. On a successful saving throw, the effect ends. You gain the ray of frost cantrip. You gain the ability to cast the alter self spell without expending a spell slot. Once you use this ability you cannot use it again until you complete a long rest. At 10th level, you can use this ability to cast the polymorph spell instead of alter self. At 18th level, you can use this ability to cast the shapechange spell instead of polymorph or alter self. You gain darkvision with a range of 60 feet. At 10th level, this ability allows you to see through any kind of darkness, including the effect of a darkness spell. You gain the ability to cast the contact other plane spell without expending a spell slot. Once you use this ability, you can’t use it again until you complete a long rest. You gain the chill touch cantrip. You gain the ability to cast the fly spell without expending a spell slot. For the duration of the spell, you manifest a shadowy aura that makes the light in a 20-foot radius of you one degree darker (bright light become dim, dim light becomes darkness). Once you use this ability, you cannot use it again until you complete a long rest. You gain damage reduction to all nonmagical weapon attacks, you are immune to acid and poison damage, and you are immune to the poisoned condition. In addition, you can gain the ability to cast the shapechange spell without expending a spell slot or material components. Once you use this ability, you cannot use it again until you complete a long rest. When you choose this mystery at 1st level, you gain the control flame cantrip, if you don’t know it yet. 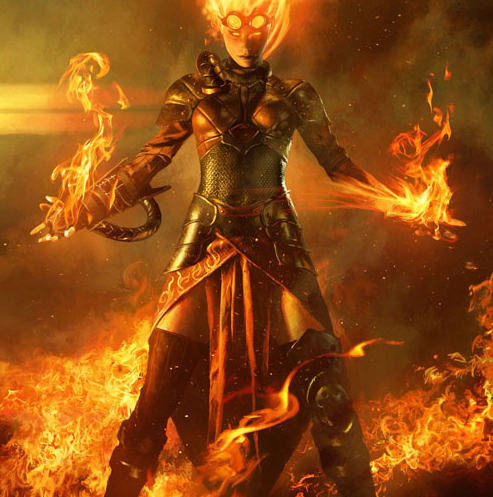 As an oracle with the Flame Mystery, you can choose from the following revelations. Whenever a creature fails a saving throw and takes fire damage from one of your spells, it catches on fire. The target takes 1d4 fire damage at the start of each of its turns. A creature can end this damage by using its action to make a Dexterity check to extinguish the flames. The DC for this check is equal to your spellcasting save DC. Your speed is increased by 10 feet while you aren’t wearing heavy armor. You can use your action to exhale a 15 foot cone of flames. Each creature in the area must make a Dexterity saving throw against a DC equal to your spellcasting save DC. A creature takes 2d6 fire damage on a failed save, and half as much damage on a successful one. The damage is increased to 3d6 at 6th level, 4d6 at 10thlevel, and 5d6 at 14th level. Once you use this ability, you must complete a short or long rest. You learn the fire bolt cantrip. You use your action to magically assume the shape of a fire elemental. You can stay in this form for 1 hour, but otherwise functions like the druid class’ Wild Shape ability, as described on pages 66-67 of the Player’s Handbook. Once you use this ability, you must complete a long rest before using it again. You can use this ability twice per long rest at 14th level, and three times per long rest at 18th level. You gain the ability to see through fire, fog, and smoke without penalty. At 6th level, you gain the ability to cast the clairvoyance spell without expending a spell slot, though to do so, you must have a source of flame at least as large as a campfire. You can use this ability once per long rest. Starting at 14th level, you gain the ability to use this ability twice per long rest. Starting at 18th level, you gain the ability to use this ability three times per long rest. You gain the ability to use a bonus action to cause waves of heat to radiate from your body. All creatures in a 15-foot cube originating from you must make a Dexterity saving throw. On a failed save, a creature takes 2d8 fire damage. On a successful save, the creature takes half as much damage. Further, until the start of your next turn, enemies suffer disadvantage on all attacks against you. Once you use this ability, you must complete a short rest before using it again. Starting at 10th level, all creatures who fail their saving throw are blinded until the start of your next turn. Starting at 18th level, all creatures who fail their saving throw gain 1 level of exhaustion. You gain resistance to fire. Starting at 14th level, you gain immunity to fire. You gain the ability to make a melee spell attack against a single target. On a hit, the target takes 1d8 fire damage. This ability’s damage increases by 1d8 when you reach 6th level (2d8), 14th level (3d8), and 18th level (4d8). Starting at 10th level, this ability can be used with a melee weapon attack, adding the damage of the weapon to the damage of this ability. This ability counts as a spell for the purpose of the burning magic revelation. You gain the ability to cast the fly spell without expending a spell slot. For the duration of the spell, you manifest flaming wings that shed bright light in a 20-foot radius and dim light for an additional 20 feet. Once you use this ability, you cannot use it again until you complete a long rest. Whenever an enemy starts its turn within 30 feet of you, it takes 10 fire damage. Targets have disadvantage on saving throws against your fire spells. When you choose this mystery at 1st level, you gain the sacred flame cantrip, if you don’t know it yet. As an oracle with the Heavens Mystery, you can choose from the following revelations. You gain the ability to use your bonus action to impose disadvantage on all saving throws against your illusion spells until the start of your next turn. Once you use this ability, you must complete a long rest before using it again. At 14th level, you can use this ability to use this ability twice per long rest. At 18th level, you can use this ability once per short rest. You gain the ability to conjure armor of starry radiance that functions as the mage armor spell as a bonus action. At 14th level, the armor also provides resistance to slashing weapon damage. You gain the ability to learn your precise location, whenever you can see the open sky at night. Further, whenever you can see the night sky, you can add your Charisma modifier to all Wisdom (Perception) checks. Finally, you gain the ability to cast a cantrip or spell without any somatic or verbal components. Once you use this ability, you must complete a long rest before using it again. You learn the chill touch cantrip. You gain the ability to leave no tracks. At 6th level, you gain the ability to hover six inches off the ground at will. At 10th level, you gain the ability to cast the fly spell without using a spell slot. One you cast fly in this manner, you cannot do so again until you complete a long rest. You gain the ability to cast the heroism spell without using a spell slot. Once you use this ability, you must complete a long rest before doing so again. At 6th level, you can affect three targets with this ability, at 10th level, you can affect five targets, at 14th level, you can affect seven targets, and at 18th level, you can affect any number of targets within 30 feet. You gain the ability to summon a bridge of shimmering moonlight which is 10 feet wide and up to 100 feet long. The bridge persists until you dispel it as a bonus action or until you complete a long rest or until you use it again. Once you use this ability, you must complete a short rest before using it again. You learn the acid splash cantrip, only this version does radiant damage instead of acid damage. You add the commune spell to your list of spells known. This does not count towards your limit of spells known. You are immune to fear effects and do triple damage on all critical hits. If you die, you are reborn 3 days later as if the reincarnation spell had been cast on you. You add your Charisma modifier to all saving throws. When you choose this mystery at 1st level, you gain proficiency with the Medicine skill and you gain the spare the dying cantrip, if you don’t know it yet. As an oracle with the Life Mystery, you can choose from the following revelations. You gain the ability to use your reaction to ignore the effect of a disease or poison for 8 hours. Once you use this ability, you can’t use it again until you complete a short or long rest. At 6th level you can use this ability twice between rests, and at 14th level, you can use this ability three times between rests. At 18th level, you gain immunity to all diseases and poisons. You gain the ability to use your action to transform yourself into a creature of pure radiant energy. You can maintain this form up to 1 minute or as long as you maintain concentration. While in this form, whenever you strike an undead target with a melee spell attack, or whenever you are hit by a melee weapon attack by an adjacent undead enemy, the undead creature takes 1d8 radiant damage. This damage increases by 1d8 when you reach 6th level (2d8), 14th level (3d8), and 18th level (4d8). While in this form you can use your action to infuse an adjacent ally with healing power, restoring 1d4 + your Charisma modifier in hit points. The amount of hit points you heal with this ability increases by 1d4 when you reach 6th level (2d4 + your Charisma modifier), 14th level (3d4 + your Charisma modifier), and 18th level (4d4 + your Charisma modifier). Whenever you use a spell of 1st level or higher to restore hit points to a creature, the creature regains additional hit points equal to 2 + the spell’s level. Whenever you cast the lesser restoration spell, you can affect two targets. When you or a friendly creature within 10 feet of you must make a saving throw, the creature gains a bonus to the saving throw equal to your Charisma modifier (with a minimum bonus of +1). You must be conscious to grant this bonus. As an action, you can open your awareness to detect living creatures. Until the end of your next turn, you know the location of any living creature within 60 feet of you. Once you use this ability, you can’t use it again until you complete a short or long rest. At 6th level you can use this ability twice between rests, and at 14th level, you can use this ability three times between rests. At 18th level, you gain immunity to all diseases and poisons. Whenever you cast a healing spell of 1st level or higher that restores hit points to a creature other than you, you regain hit points equal to 2 + the spell’s level. Whenever your healing spells heal a target up to its maximum hit points, any excess hit points persist for 1 minute as temporary hit points. You gain the ability Turn Undead, as a cleric of your level. Once you use this ability, you can’t use it again until you complete a short or long rest. Beginning at 6th level, you can use this ability twice between rests, and beginning at 18th level, you can use it three times between rests. You cannot die for any reason. If you are reduced to less than 1 hit point by an attack or effect, you are immediately restored to 1 hit point. Your healing spells restore an extra 1d6 hit points when cast. When you choose this mystery at 1st level, you gain proficiency in your choice of two of the following skills: Arcana, History, Nature, or Religion. As an oracle with the Lore Mystery, you can choose from the following revelations. You can add one spell from the Wizard’s spell list to your list of spells known. The spell selected must be of a level equal to a spell slot which you can cast. Whenever you gain a level in the oracle class, you can swap the spell known for a new Wizard spell. You gain the ability to use your actions for 1d6 rounds to maintain a trance. When you come out of the trance you make one Intelligence skill check and treat the result as if you had rolled a 20. Once you use this ability, you must complete a long rest before using it again. When you reach 14th level, you may use this ability twice per long rest. You gain the ability to use your Charisma bonus in place of your Intelligence bonus when making any Intelligence skill checks. You add +1 to your Intelligence score. While you are not wearing armor or carrying a shield, your AC equals 10 + your Dexterity modifier + your Charisma modifier. You gain the ability to cast the symbol spell without using a spell slot. Once you use this ability, you must complete a long rest before using it again. You can gain advantage on one Intelligence ability or skill check. You may decide to use this ability after you roll. Once you use this ability, you must complete a long rest before using it again. At 10th level, you can use this ability to use this ability twice per long rest. At 14th level, you can use this ability three times per long rest. At 18th level, you can use this ability four times per long rest. Whirlwind Lesson Prerequisite: 6th level When you cast a divination spell of 2nd level or higher using a spell slot, you regain one expended spell slot. The slot you regain must be of a level lower than the spell you cast and can’t be higher than 5th level. You gain advantage on all Intelligence skill checks. You can cast the wish spell without using a spell slot once. When you choose this mystery at 1st level, you gain the frostbite cantrip, if you don’t know it yet. 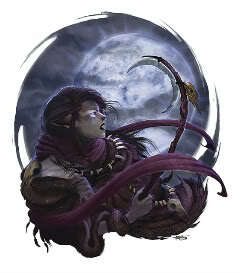 As an oracle with the Lunar Mystery, you can choose from the following revelations. You gain the ability to use the Wild Shape ability as if you were a druid with a number of druid levels equal to your oracle levels. Once you use this ability, you must complete a long rest before using it again. At 14th level, you can use this ability to use this ability twice per long rest. At 18th level, you can use this ability three times per long rest. You gain darkvision to 60 feet, if you do not have darkvision. If you do have darkvision you now see 60 feet further with darkvision. At 14th level, you gain the ability to cast true seeing without using a spell slot. Once you cast true seeing in this manner, you must complete a long rest before using it again. You gain the ability use a bonus action to transform your hands into a pair of vicious claws which last for as long as you maintain concentration. They are melee weapons with which you are proficient that do 1d4 slashing damage. At 6th level, they do 1d6 slashing damage, at 14th level, they do 1d8 slashing damage, and at 18th level, they do 1d10 slashing damage. You learn the dancing lights cantrip. You are also immune to lycanthropy and cannot become a lycantrope for any reason. At 14th level, you gain advantage on all saving throws against spells and effects that would change your shape. You learn the firebolt cantrip, only it does radiant damage instead of fire damage. You add the augury spell to your list of spells known. This does not count towards the total number of spells you can learn. You gain an animal companion that is functionally identical to the Ranger’s Companion ability found on page 93 of the Player’s Handbook. You gain the ability to cause a target hit by one of your spells or cantrips to make a Wisdom saving throw or be affected by a confusion spell until the start of your next turn on a failed save. Once you use this ability, you must complete a long rest before using it again. At 14th level, you can use this ability to use this ability twice per long rest. At 18th level, you can use this ability three times per long rest. When you choose this mystery at 1st level, you gain proficiency in heavy armor and the blade ward cantrip, if you don’t know it yet. As an oracle with the Metal Mystery, you can choose from the following revelations. You gain the ability to add your Dexterity modifier to your AC, regardless of the type of armor worn. While wearing metal armor, your speed is increased by 10 feet. You gain advantage on all Constitution saving throws. You add the stoneskin spell to the list of spells you know. This does not count towards your limit of spells known. You can use your Action to create a melee simple or martial weapon made entirely of metal. You can add your proficiency bonus to attacks made with this weapon. The weapon remains for 1 minute or until you drop the weapon. At 6th level, this weapon is treated as magic. Once you use this ability, you must complete a short rest before using it again. You add the transmute rock spell to the list of spells you know. This does not count towards your limit of spells known. You gain the ability to use your Action to corrode a nonmagical ferrous metal object you hit with a melee attack within 5 feet. If the object isn’t being worn or carried, this ability destroys a 1-foot cube of it. If the object is being worn or carried by a creature, the creature can make a Dexterity saving throw to avoid the effect. If the object touched is either metal armor or a metal shield being won or carried, its takes a permanent and cumulative -1 penalty to the AC it offers. Armor reduced to an AC of 10 or a shield that drops to a +0 bonus is destroyed. If the object rusted is a held metal weapon, the weapon takes a permanent and cumulative -1 penalty to damage rolls. If its penalty drops to -5, the weapon is destroyed. You gain proficiency in martial weapons. You gain the ability to use a bonus action to transform a scarf, sleeve, cloak, or other piece of clothing into something as hard as steel that stretches out to up to 30 feet. You can then make a melee spell attack against any target within 30 feet, doing 1d8 slashing damage on a hit. This ability’s damage increased by 1d8 when you reach 6th level (2d8), 14th level (3d8), and 18th level (4d8). You gain resistance to all nonmagical weapon attacks. You do triple damage on any critical hits. When you choose this mystery at 1st level, you gain the shillelagh cantrip, if you don’t know it yet. As an oracle with the Nature Mystery, you can choose from the following revelations. You add the find steed spell to the list of spells you know. This does not count towards your limit of spells known. You learn the shocking grasp cantrip, only it does acid damage instead of lightning. You add the conjure animals spell to the list of spells you know. This does not count towards your limit of spells known. You may add your Charisma modifier to your AC, rather than your Dexterity. When you cast the Speak with Animals spell, it does not expend a spell slot. You learn the spare the dying cantrip. At 10th level, you gain the ability to cast death ward without expending a spell slot, while you are within a natural environment. Once you use this ability you must complete a long rest before using it again. You learn the message cantrip. At 18th level, you add the telepathy spell to your list of spells known. This does not count towards you limit of spells known. You can use the Druid’s wild shape ability as if you were a 20th level Druid with the Circle of the Moon. When you choose this mystery at 1st level, you learn the sacred flame cantrip, if you don’t know it yet. As an oracle with the Solar Mystery, you can choose from the following revelations. You add the teleport spell to your list of spells known. This does not count towards the total number of spells you can learn. You gain the ability to use your action to transform yourself into a form of churning light for as long as you maintain your concentration. While in this form, you gain the benefits of the blur spell and you give off light as a lantern. At 10th level, you gain the ability to use your action to flash while in this form and cause all targets adjacent to you to make a Dexterity saving throw or be blinded for 1 minute. Each effected target can repeat the saving throw at the end of each of its turns. You gain proficiency in the Survival skill and learn three languages. So long as you are exposed to at least four hours of sunlight per day, you no longer need to eat or drink to survive and you gain advantage on all saving throws against disease. At 10th level, you become immune to all diseases and poisons. You learn the gust cantrip. You may use the Dodge action as a quick action. Once you use this ability you must complete a short or long rest before using it again. At 10th level, you can use this ability twice per rest. You can cast the dimension door without using a spell slot. Once you use this ability, you must complete a long rest before using it again. At 18th level, you may use this ability twice per long rest. You gain the ability to cast the clairvoyance spell without expending a spell slot, though you can only detect places touched by sunlight. You can use this ability once per long rest. Staring at 10th level, you can use this ability to cast the scrying spell without expending a spell slot, though you can still only detect places touched by sunlight. Starting at 14th level, you can use this ability twice per long rest. Starting at 18th level, you can use this ability three times per long rest. You gain the ability to cast the darkness spell without expending a spell slot. Once you use this ability you must complete a long rest before using it again. You can also cause a light source within 60 feet to either double or halve the radius it illuminates. You suffer no penalties from aging and cannot be magically aged. Targets have disadvantage on saving throws against your fire, light, and sun spells. When you choose this mystery at 1st level, you gain the mold earth cantrip, if you don’t know it yet. As an oracle with the Stone Mystery, you can choose from the following revelations. You gain resistance to acid. Starting at 14th level, you gain immunity to acid. Whenever you score a critical hit against an opponent with a melee weapon attack or a spell attack (melee or ranged), the target is also knocked prone. You can use your Action to see through stone, earth, or sand as if it were transparent glass. This lasts for as long as you maintain your concentration or up to 1 minute. Once you use this ability, you must complete a long rest before using it again. At 14th level, you can use this ability once per short rest. You add the passwall spell to the list of spells you know. This does not count towards your limit of spells known. You learn the magic stone cantrip. In your hands, rocks and stone become a lethal weapon. You can use your action to make a ranged spell attack against one target within 60 feet. On a hit the target takes 1d8 bludgeoning damage and its speed is reduced by 10 feet until the start of your next turn. This damage increases by 1d8 when you reach 6th level (2d8), 14th level (3d8), and 18th level (4d8). You add the thunderwave spell to the list of spells you know. This does not count towards your limit of spells known. You gain the ability to use your Reaction to cause damage to melee weapons that strike you. When you are hit with a melee weapon, make a melee spell attack against your attacker. On a hit, the weapon takes a permanent and cumulative -1 penalty to damage rolls. If its penalty drops to -5, the weapon is destroyed. Once you use this ability, you must complete a short rest before using it again. You cannot be knocked prone and enemies attempting to shove you do so at disadvantage. At 10th level, you gain advantage on all attempts to shove enemies. Whenever an enemy starts its turn within 30 feet of you, it must make a Constitution saving throw or be knocked prone. In addition, all land within 30 feet of you is treated as difficult terrain by your enemies. Targets have disadvantage on saving throws against your earth, rock, and stone spells. When you choose this mystery at 1st level, you gain advantage on all Initiative checks. As an oracle with the Time Mystery, you can choose from the following revelations. You may make a melee spell attack against a target. On a hit, the target gains one fatigue level. Once you use this ability, whether you hit or not, you cannot use this ability again until you complete a short rest. At 10th level, you gain one extra use of this ability per short rest (2), at 14th level you can use this ability three times per short rest. You add the hold person spell to your list of spells you know. This does not count towards your limit of spells known. You gain the Wizard class’ School of Divination ability, Portent, as described on page 116 of the Player’s Handbook. When you make an attack roll or a saving throw, you can roll a d4 and add it to the attack roll or saving throw. Once you use this ability, you must complete a long rest before using it again. At 10th level, you can use this ability to use this ability twice per long rest. At 14th level, you can use this ability three times per long rest. At 18th level, you can use this ability four times per long rest. You add the haste spell to your list of spells you know. This does not count towards your limit of spells known. When you roll initiative, you can roll a d6 and add it to the result. Once you use this ability, you must complete a long rest before using it again. At 10th level you gain the ability to roll initiative three times and keep the highest of the results. You add the blur spell to your list of spells you know. This does not count towards your limit of spells known. You add the teleport spell to your list of spells you know. This does not count towards your limit of spells known. You gain the ability to cast the true seeing spell without using a spell slot. Once you use this ability, you must complete a short rest before using it again. You can use this ability twice per short rest at 18th level and it can function as the foresight spell. You suffer no penalties from aging and cannot be aged, magically or otherwise. You are immune to disease and poison. You can cast the time stop spell without using a spell slot once. When you choose this mystery at 1st level, you gain the shape water cantrip, if you don’t know it yet. As an oracle with the Waves Mystery, you can choose from the following revelations. You gain the ability to cast the ice storm spell without using a spell slot. Once you use this ability, you must complete a long rest before using it again. You can use this ability twice per long rest at 14th level. You gain the ability to take the Dodge action as a bonus action. You gain the ability to walk on liquid as if it were a solid surface. Walking on the liquid in this manner does not harm you, even if it is a normally harmful substance, like acid or lava. At 6th level, you gain the ability to cast the water breathing spell without using a spell slot, though you are the only target effected. Whenever a creature fails a saving throw and takes cold damage from one of your spells, the target has its speed reduced to half, rounding down. The target can end this effect by using its action to make a Strength check to break the icy coating. You gain the ability to conjure armor of ice that functions as the mage armor spell as a bonus action. At 14th level, the armor also provides resistance to piercing weapon damage. You gain resistance to cold. At 14th level, you gain immunity to cold. You gain the ability to cast the polymorph spell without using a spell slot, but you can only transform the target into a harmless form, such as a frog or a mouse. Once you use this ability, you must complete a long rest before using it again. At 14th level you can use this ability twice per long rest. You use your action to magically assume the shape of a water elemental. You can stay in this form for 1 hour, but otherwise functions like the druid class’ Wild Shape ability, as described on pages 66-67 of the Player’s Handbook. Once you use this ability, you must complete a long rest before using it again. You can use this ability twice per long rest at 14th level, and three times per long rest at 18th level. You gain the ability to see through fog and mist without any penalty. At 10th level, you gain the ability to use a calm pool of water at least 1 foot in diameter to cast the scrying spell without using a spell slot. Once you use this scrying ability, you must complete a long rest before using it again. At 18th level, you can use this scrying ability at will. Whenever you cast a spell with that does cold damage or that has water in the name, you can apply one of the following metamagic effects, as if you were a Sorcerer, without spending sorcery points: Empowered Spell, Extended Spell, or Subtle Spell. You gain a swim speed of 90 feet. When you choose this mystery at 1st level, you gain the gust cantrip, if you don’t know it yet. As an oracle with the Wind Mystery, you can choose from the following revelations. You gain the ability to conjure armor made of swirling winds that functions as the mage armor spell as a bonus action. At 14th level, the armor also forces enemies to make ranged attacks against you at disadvantage. You add the gaseous form spell to the list of spells you know. This does not count towards your limit of spells known. You add the invisibility spell to the list of spells you know. This does not count towards your limit of spells known. You can use your action to exhale destructive lightning energy. When you use this ability, each creature within a 5 by 30 foot line must make a Dexterity saving throw or take 2d6 lightning damage. The damage increases to 3d6 at 6th level, 4d6 at 14th, and 5d6 at 18th level. Once you use this ability, you must complete a short or long rest before using it again. You gain resistance to lightning. At 14th level, you gain immunity to lightning. You learn the shocking grasp cantrip. Whenever a creature fails a saving throw and takes damage from one of your spells, it must make a Constitution saving throw or be pushed 10 feet in a random direction. You can choose to not use this ability when you attack. You ignore any penalties to Perception checks caused by blowing particles or naturally obscuring phenomena (such as fog or mist). At 6th level, you add the augury spell to your list of spells known. At 10th level, you add the commune and divination spells to your list of spells known. None of these spells count towards you limit of spells known. You can cast the fly spell without expending a spell slot. Once you use this ability, you must complete a long rest before using it again. At 18th level, you may use this ability once per short rest. Whenever an enemy starts its turn within 30 feet of you, it must make a Constitution saving throw or be pushed 10 feet away from you. In addition, all land within 30 feet of you is treated as difficult terrain by your enemies. You gain a fly speed of 120 feet. When you choose this mystery at 1st level, you gain the thorn whip cantrip, if you don’t know it yet. As an oracle with the Wood Mystery, you can choose from the following revelations. You gain the ability to cast the fabricate spell without using as spell slot, though you can only affect wooden objects. Once you use this ability, you must complete a long rest before using it again. When you reach 10th level, you can use this ability to reshape wood as an action. This functions as a move earth spell that targets wood instead of earth. You gain the ability to cast the flesh to stone spell without using a spell slot, though the target transforms into wood instead of stone. Once you use this ability, you must complete a long rest before using it again. You can use this ability twice per long rest at 18th level. You gain the ability to speak with wood and learn what it knows. You must spend 1 minute meditating and communing with the wood and then you gain knowledge as if you had successfully cast the legend lore spell. Once you use this ability, you must complete a long rest before using it again. You can use your action to create a burst of wooden splinters from your body. Each creature other than you within 5 feet must make a Dexterity saving throw against your spell save DC or suffer 1d6 piercing damage. The ability’s damage increases by 1d6 when you reach 5th level (2d6), 11th level (3d6), and 17th level (4d6). You gain the ability to cast the polymorph spell without using a spell slot, though you can only transform into plant creatures, instead of beasts. Once you use this ability, you must complete a long rest before using it again. You gain the ability to conjure armor of wood that functions as the mage armor spell as a bonus action. At 14th level, the armor also provides resistance to slashing weapon damage. You gain the ability to use a bonus action to alter your vision for 1 minute so as to see through underbrush and plant growth that would normally grant concealment. Once you use this ability, you must complete a long rest before using it again. Beginning at 7th level, this ability improves such that you can see through wood and other plant material as if it was transparent glass. You can use this ability twice per long rest at 14th level, and three times per long rest at 18th level. You learn the shillelagh cantrip. You gain the ability to move through any sort of undergrowth (such as natural thorns, briars, overgrown areas, and similar terrain) at your normal speed without taking damage or suffering any other impairment. You gain an AC of 13 + your Dexterity bonus. Any creatures that strike you with melee attacks suffer 1d6 piercing damage from the thorns that cover your body. You are immune to poison damage, and the petrified and poisoned condition. For characters who wish to multiclass as an oracle, the minimum ability scores to multiclass as an oracle is Charisma 13. 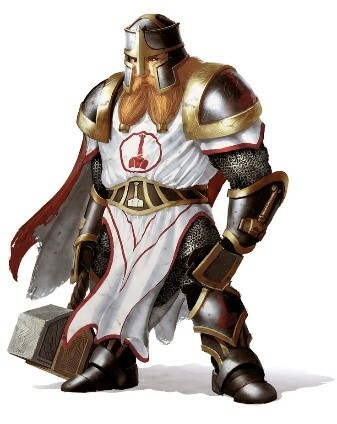 Further, when you multiclass into the oracle class you gain proficiency in light armor, medium armor, and shields. Finally, when calculating the spell slots available to a multiclass character with levels in the oracle class, you include all levels in magus, when calculating your Multiclass Spellcaster spell slots. See pages 163 and 164 of the Player’s Handbook for more information on multiclassing in 5E.